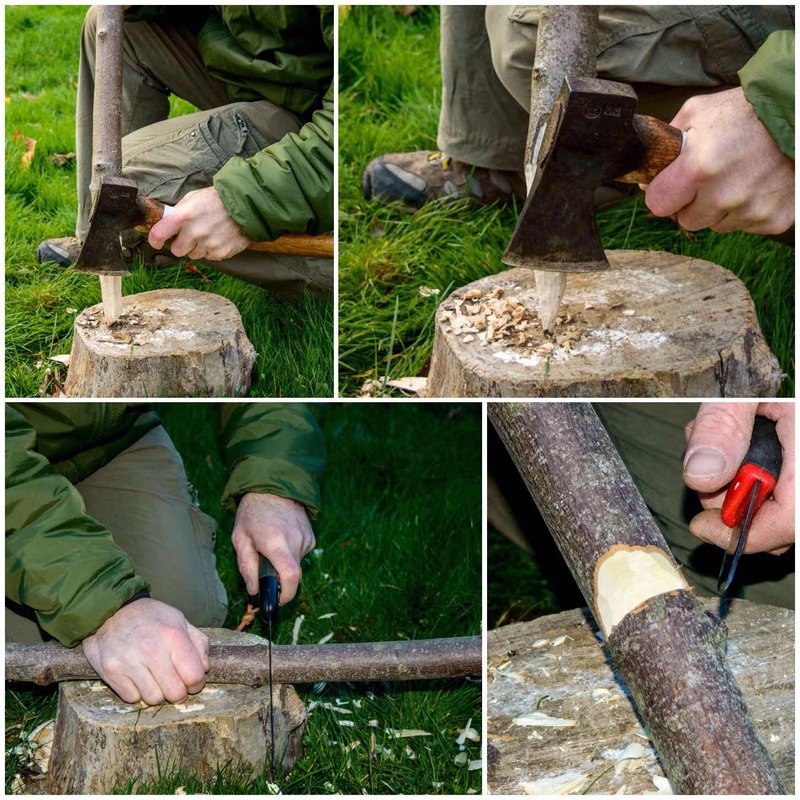 Many many years ago I stumbled upon a website called Bushcraft UK and realised that there were many folk out there just like me, struggling to get to grips with all the different ways of making fire. The results on the site only took me so far so I was even happier when I spotted a thread on the Bushmoot. 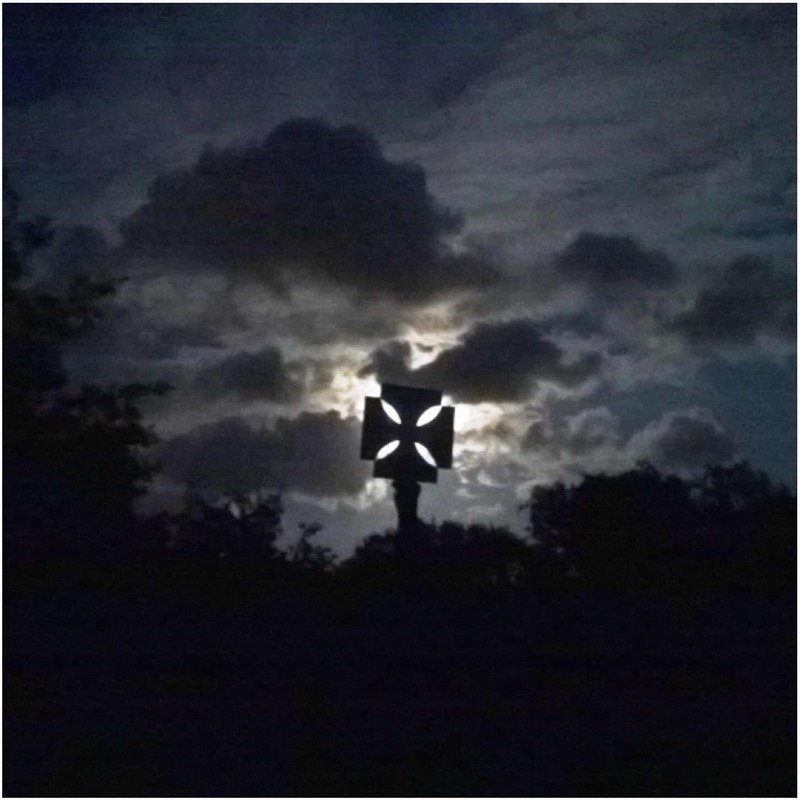 This was the second Bushmoot way back in 2005. 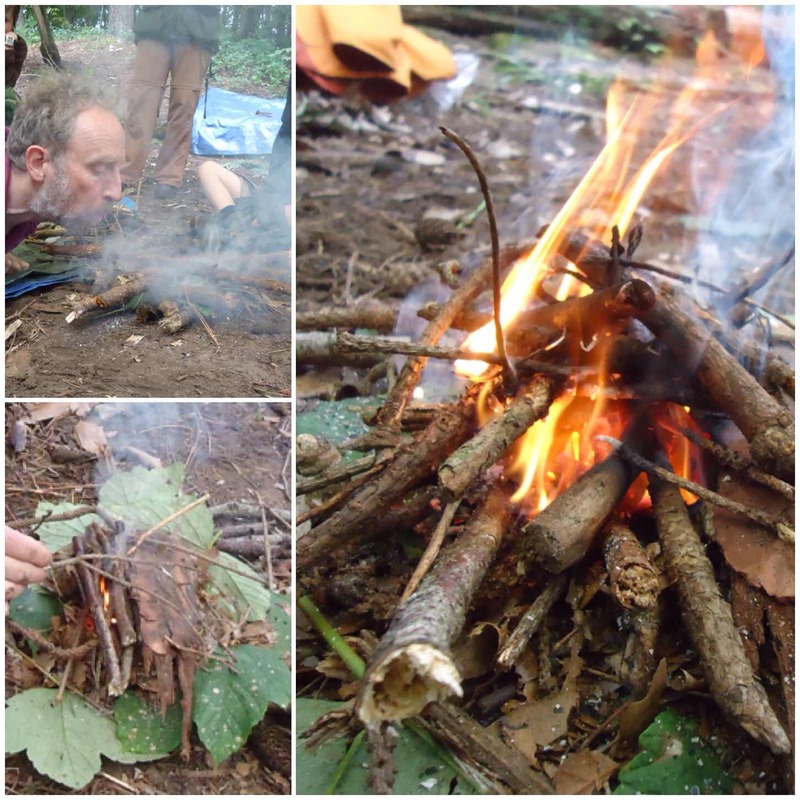 Since then I have discovered many different ways of making fire when out and about. 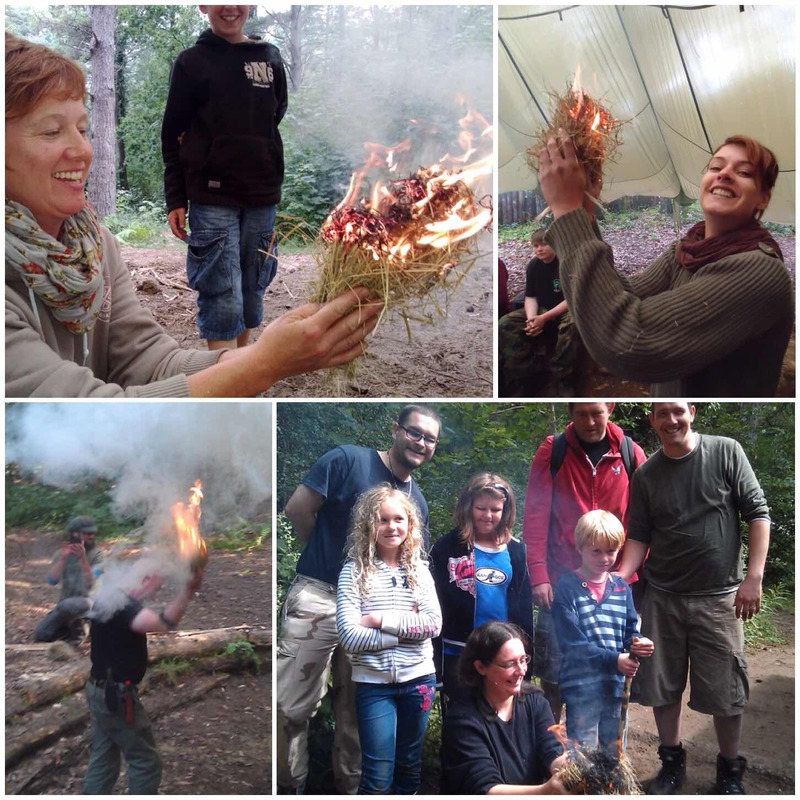 This post is about just some of the ways we make fire at the BCUK Bushmoot. 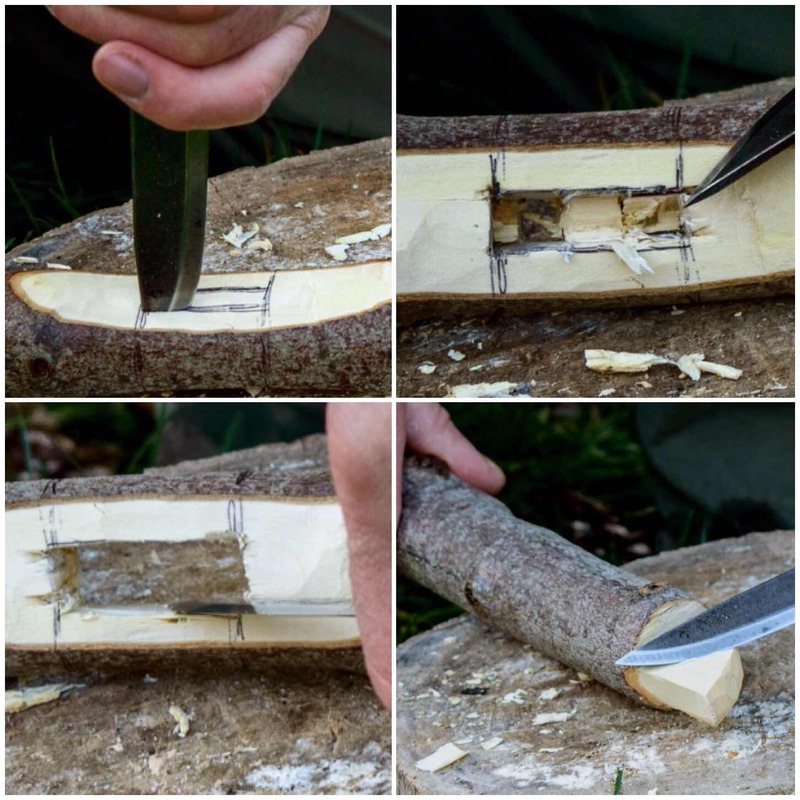 One of the most common methods a bushcrafter will use to light a fire is a Firesteel, so there are plenty of people willing to share with you how they use theirs and explain what tinders they use. 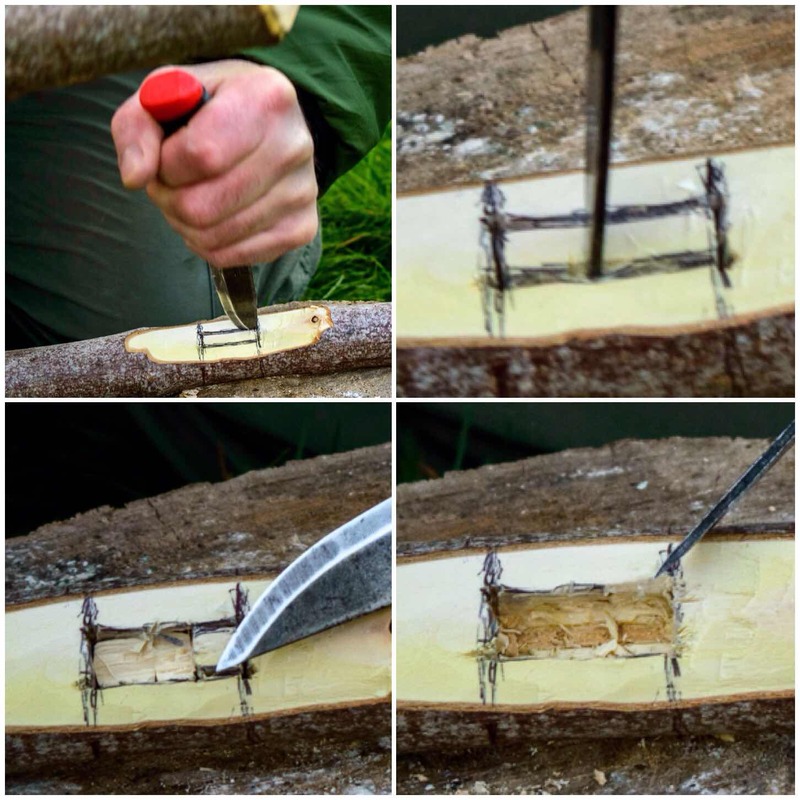 We have included the use of Firesteels into our ‘Starter Course‘ at the Moot. 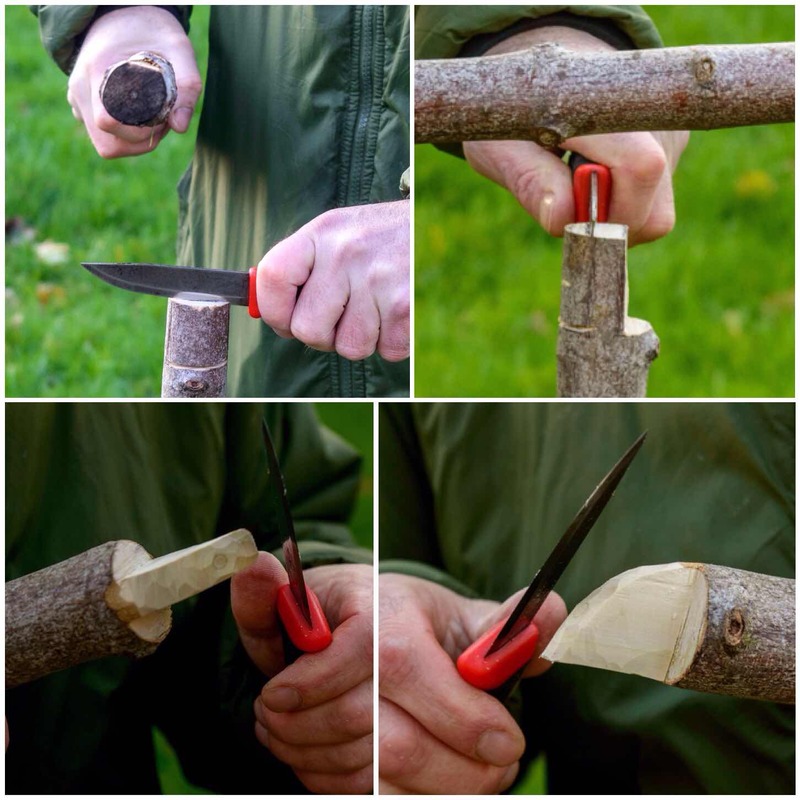 They are easy to use and the kids love them. When teaching very young kids (pre school) I liken them to creating Fairy lights and this seems to catch the children’s imagination. 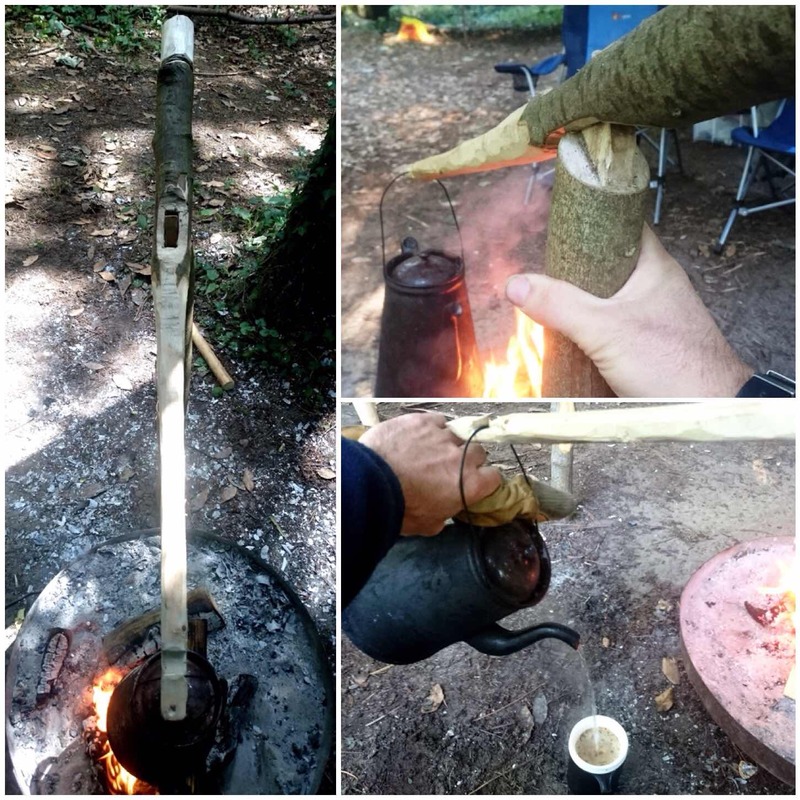 The first person to teach me to use a Firesteel properly at the Moot was Kevin Warrington (Laplander’s Natural Lore Blog) and after I attended his bowdrill class he asked me to come back and assist him with fire-making the next year. 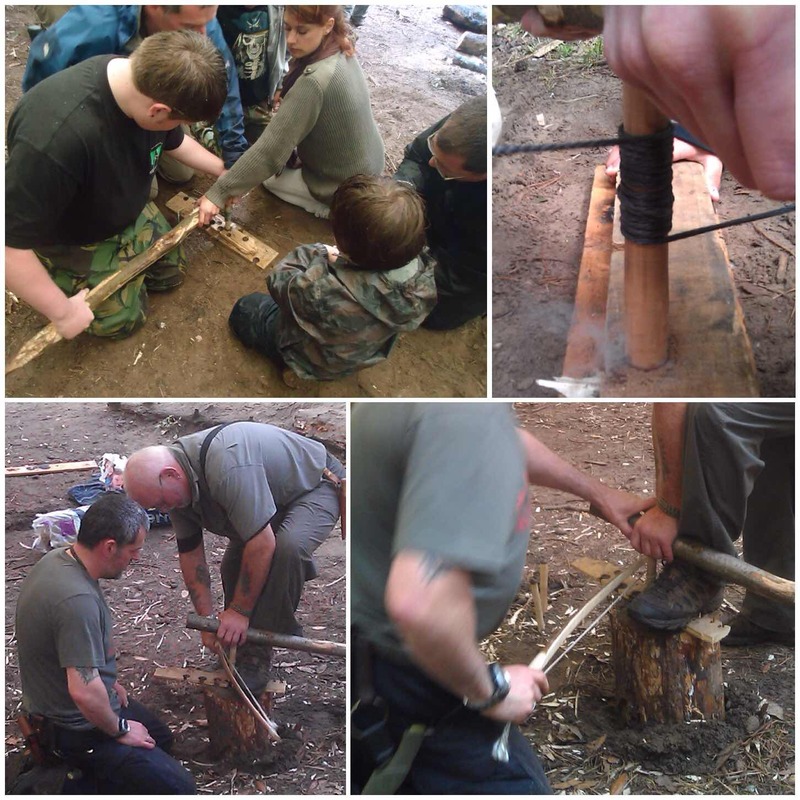 We have been good friends ever since and I have to thank Kevin for getting me started on the road to instructing others in the world of bushcraft. 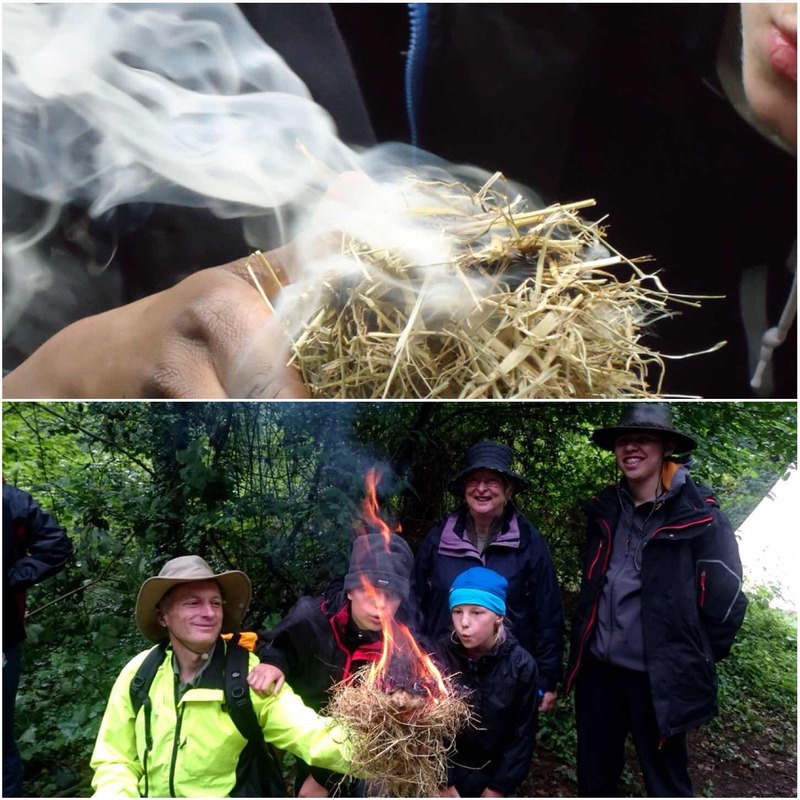 The Starter course at the Moot is not just about lighting a fire, it is also about making anyone preparing and maintaining a fire, and just as importantly it is about putting a fire out safely. 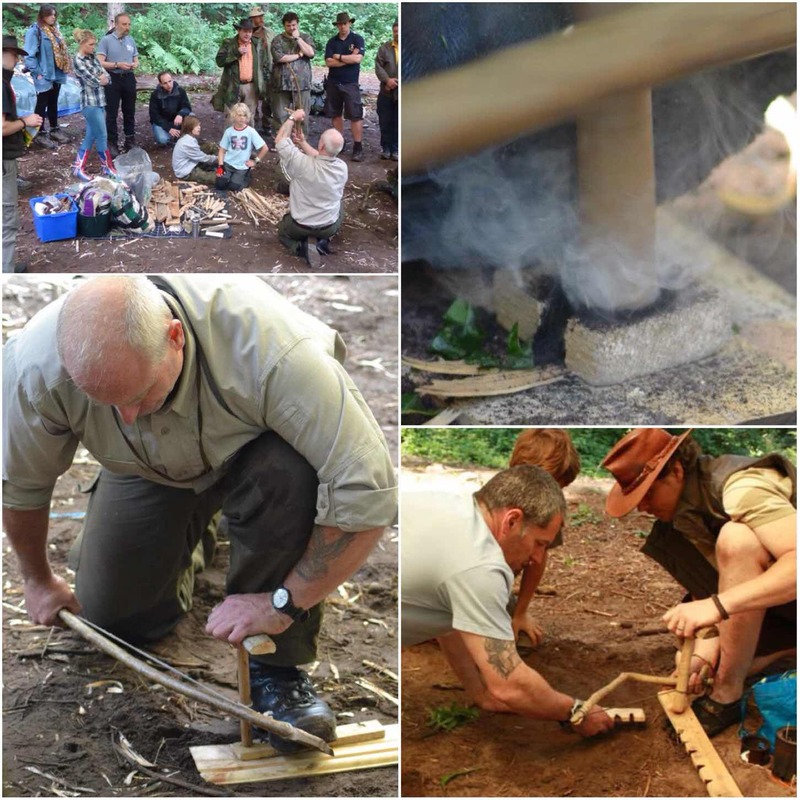 It is great to see a whole family come together to learn how to work as a team to get all the resources they need for their fire and to coax that initial burst of heat into a well-established fire. From time to time some of the instructors will bring along some of their pump drills or other similar training aids. 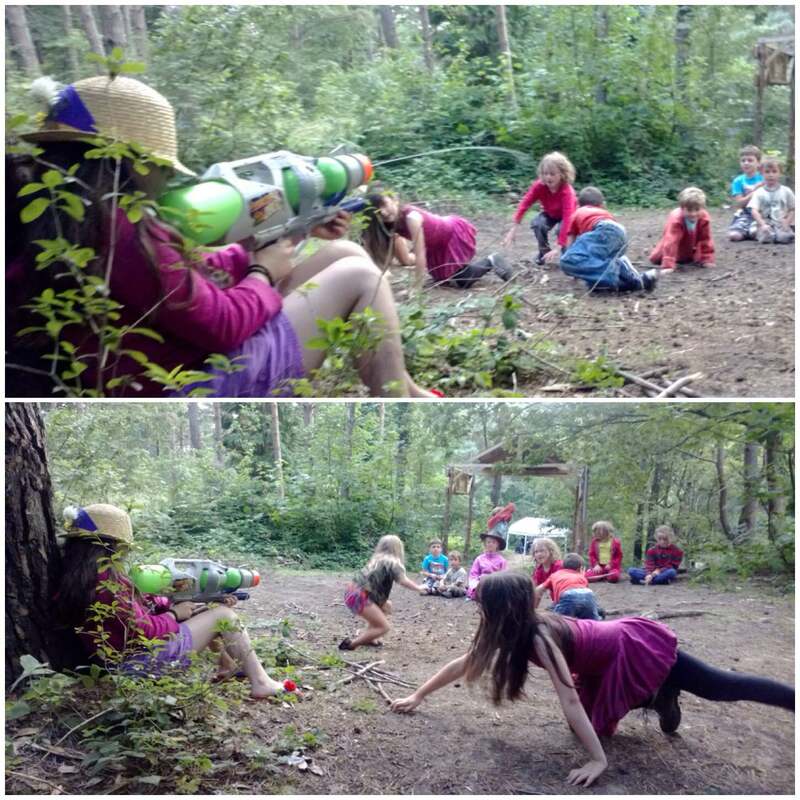 The pump drills prove a great hit with all the kids and once they get the hang of the system they soon have them spinning madly away as they attempt to produce some smoke. 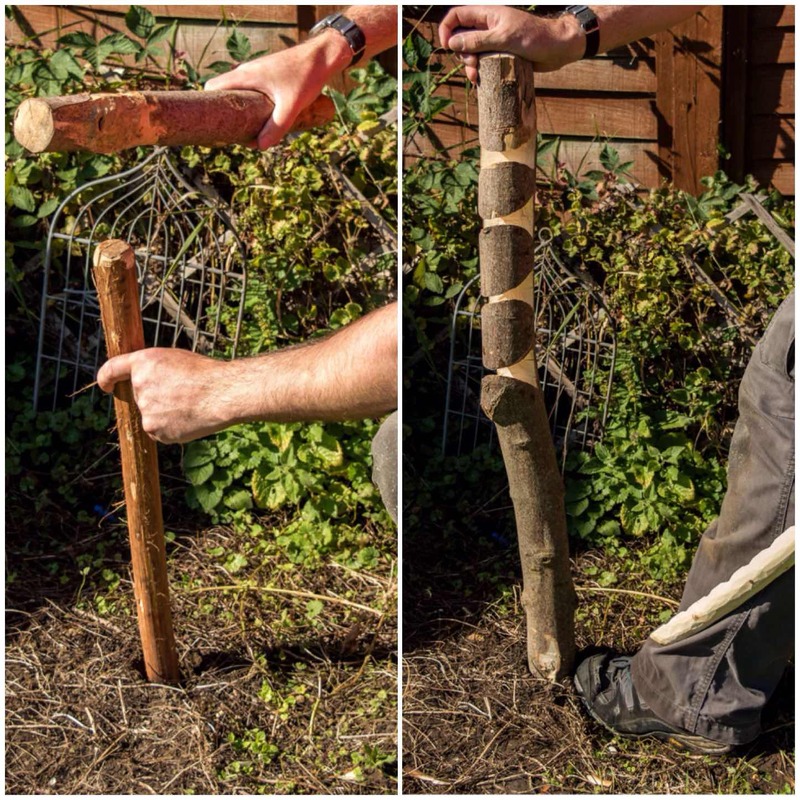 These drills were supplied a couple of years ago by Perry McGee of the National Tracking School. 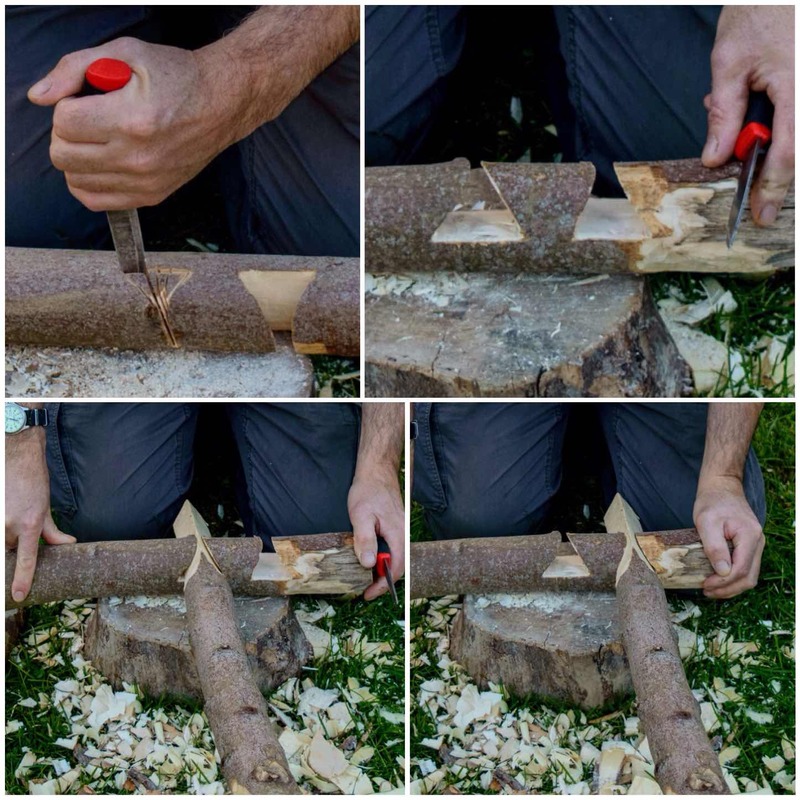 A favourite of mine over the years has to be the bowdrill. I have lost count of the number of people I have helped master this skill at the Moot. 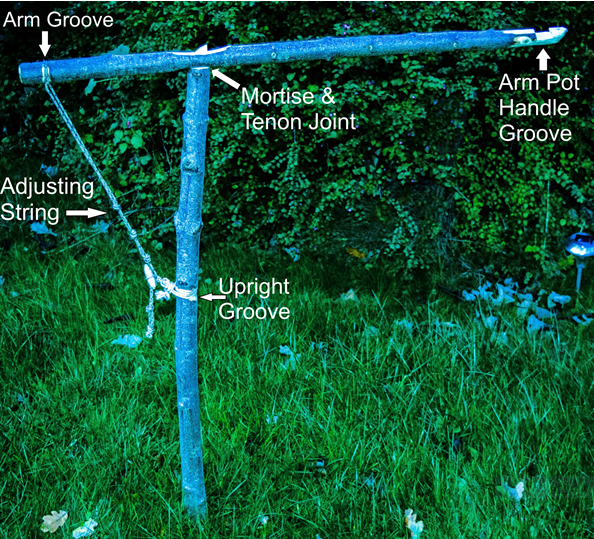 One of the reasons I love teaching this skill is that there are so many factors to take into account when bowing you can easily lose a whole day when teaching it. 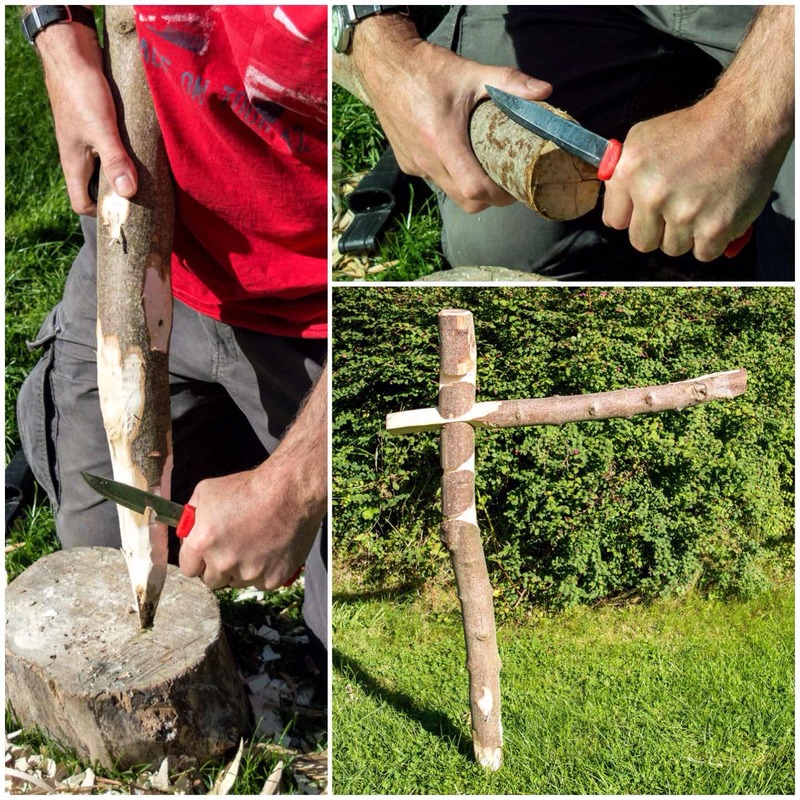 Recently a number of other instructors like Mark Oriel have stepped forward to teach this skill enabling me to focus on other areas to develop myself. 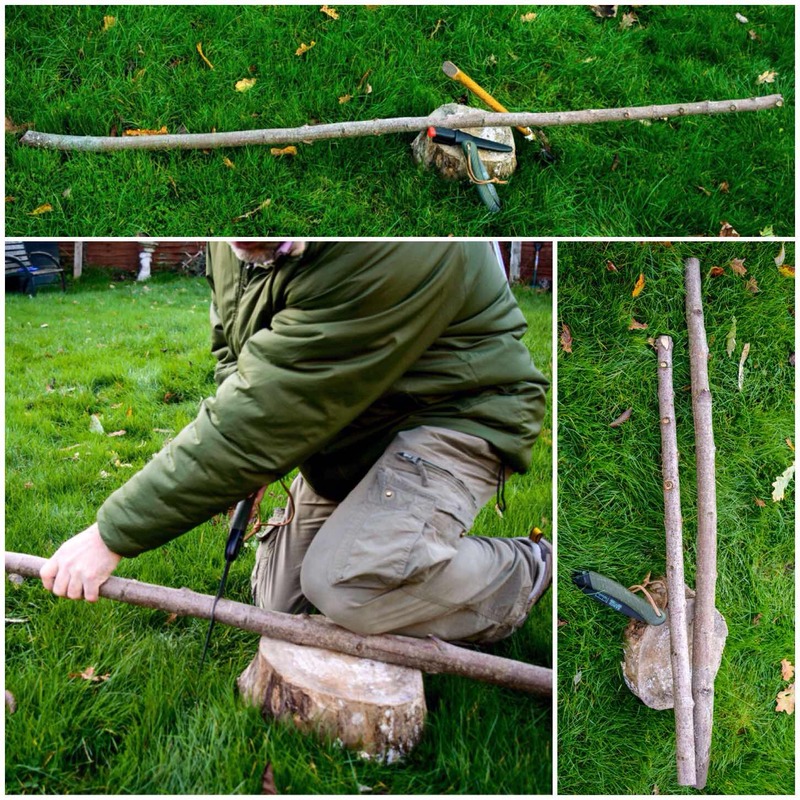 While teaching bowdrill I use two methods. 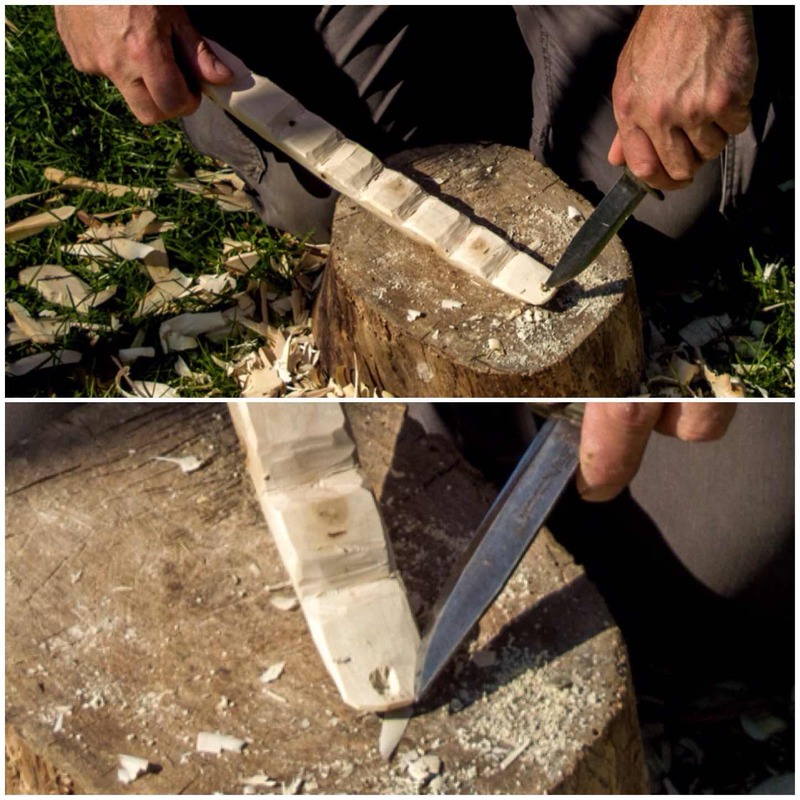 One is with a single wrap of cord around the drill piece and the other is with multiple wraps (the Egyptian method). The single wrap is easy to set up however it puts a lot of strain on the cord and if the drill and the bearing block become separated the drill piece tends to ping off to the side. The Egyptian method relies on multiple wraps, it takes longer to set up and can be more difficult to control. It does though have the advantage of not putting so much strain on the cord and the drill does not ping off to the side when it becomes detached from the bearing block. 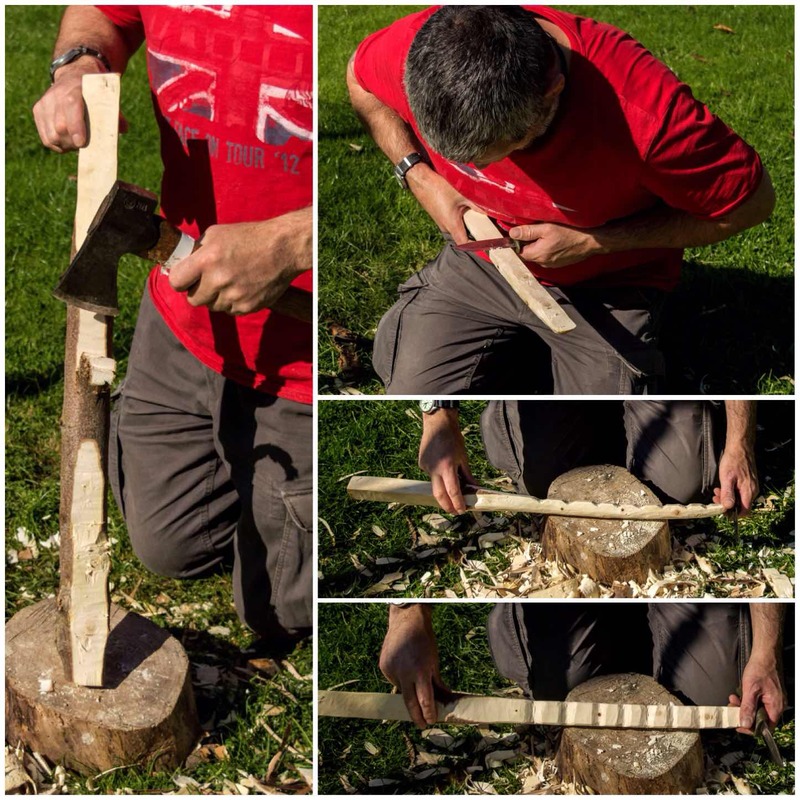 Here is the bowdrill in action using the single wrap method. 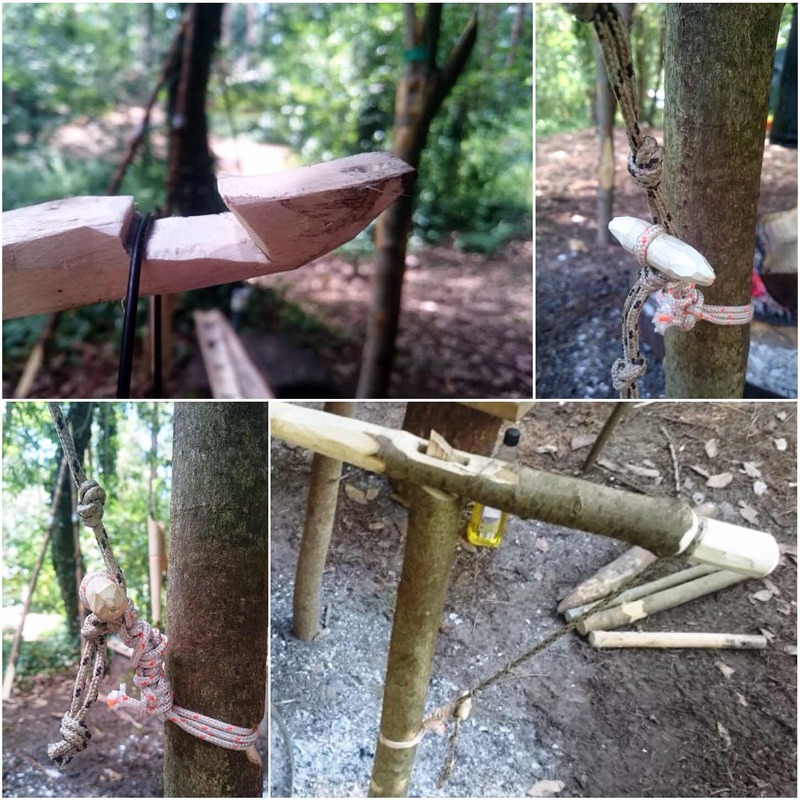 As we get a lot of children at the Moot and from time to time someone carrying an injury you need to devise other strategies for bowdrilling. 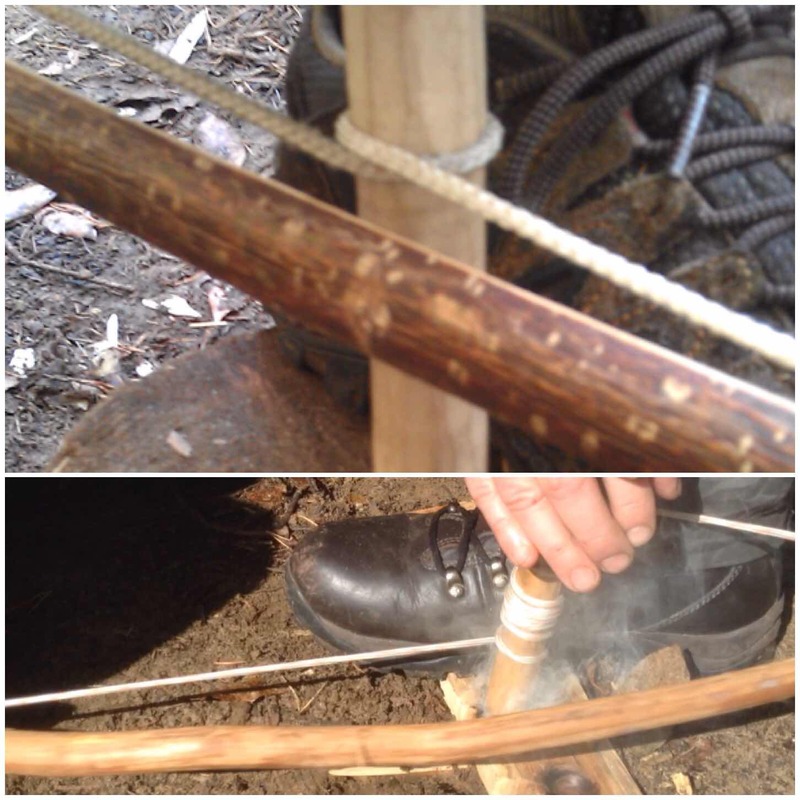 Historically I believe bowdrilling was a communal affair as it requires a lot less effort from individuals to get fire when they work together. 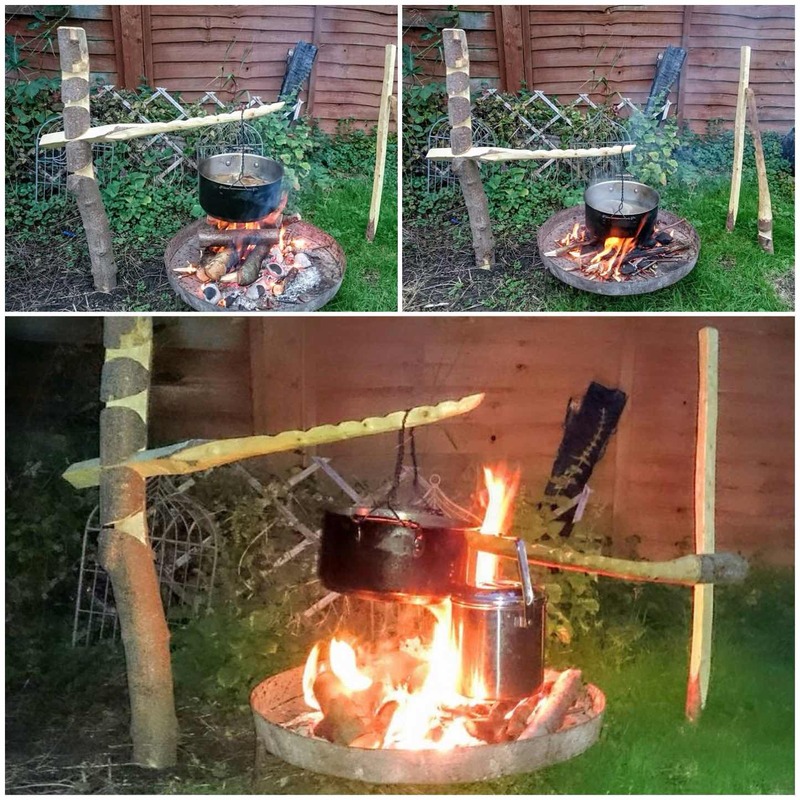 I set up Group Bowdrill sessions for families where a couple of people can hold a large bearing block in place and a couple of others can push the bow back and forth to generate the heat required (approx 425 degrees Celsius) to produce an ember. 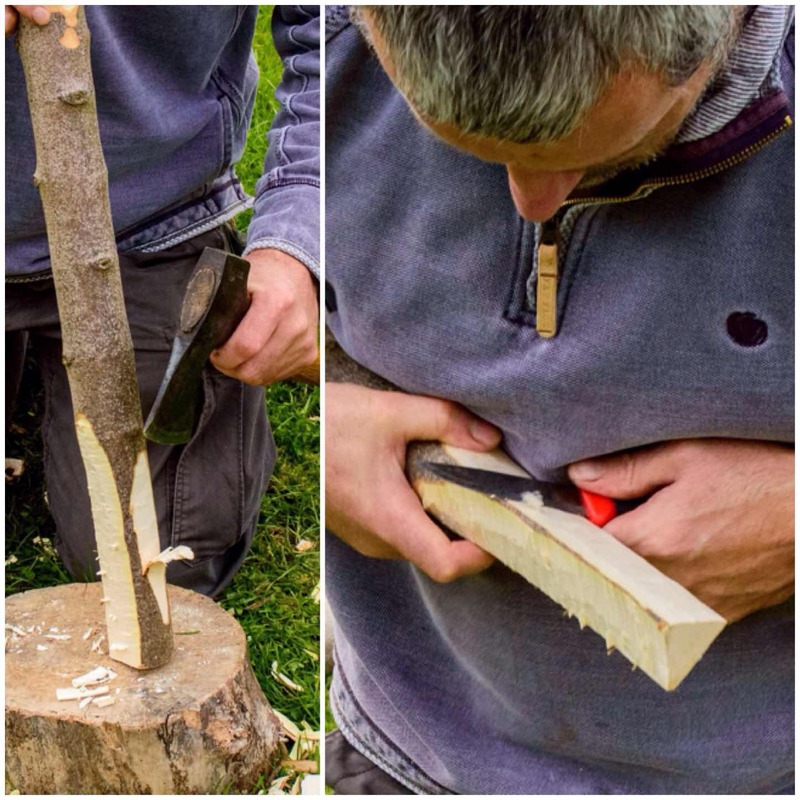 This method usually results in a massive ember, which increases the chance of getting a flame. Another method is to use the large bearing block with the bowyer holding one end as a bearing block with the other end dug into the ground. 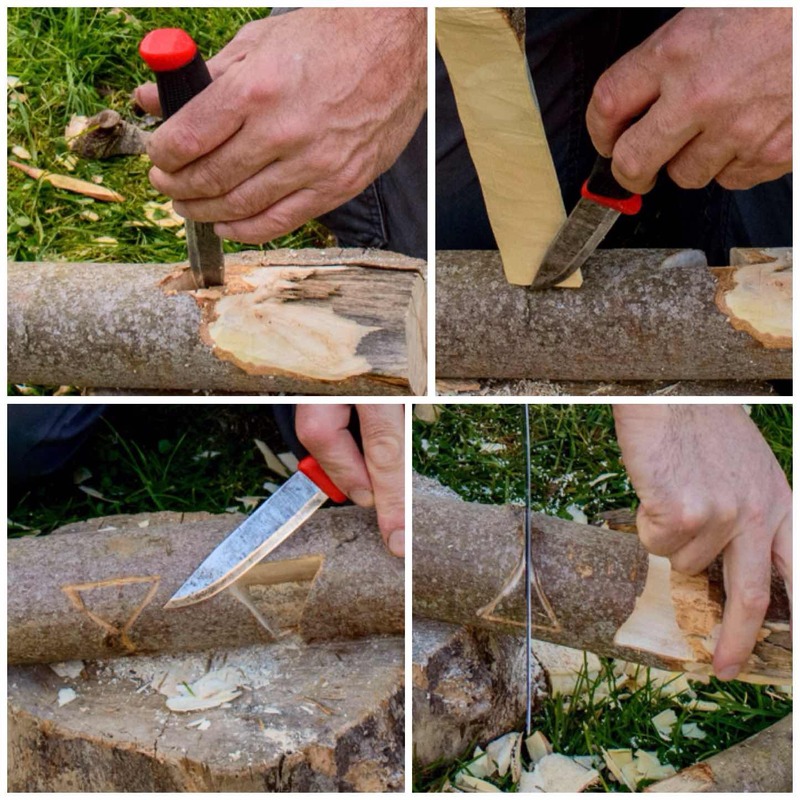 In the bottom two pictures you can see that Dave is also using a ’round’ of wood to raise the hearthboard making the act of bowing easier. 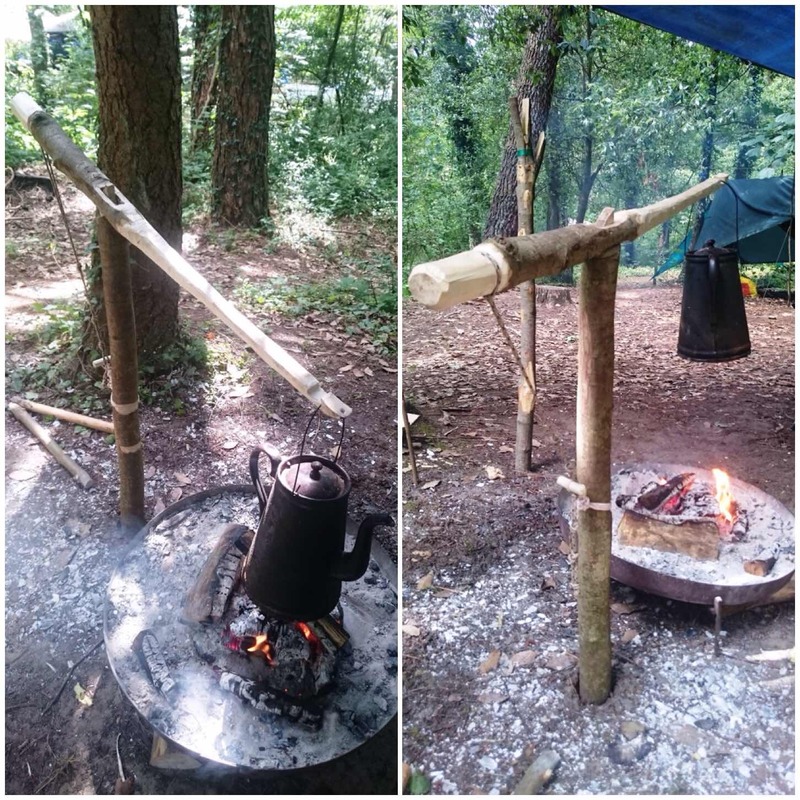 I made a short video of a bow in action with the Egyptian method at the Moot a couple of years ago. 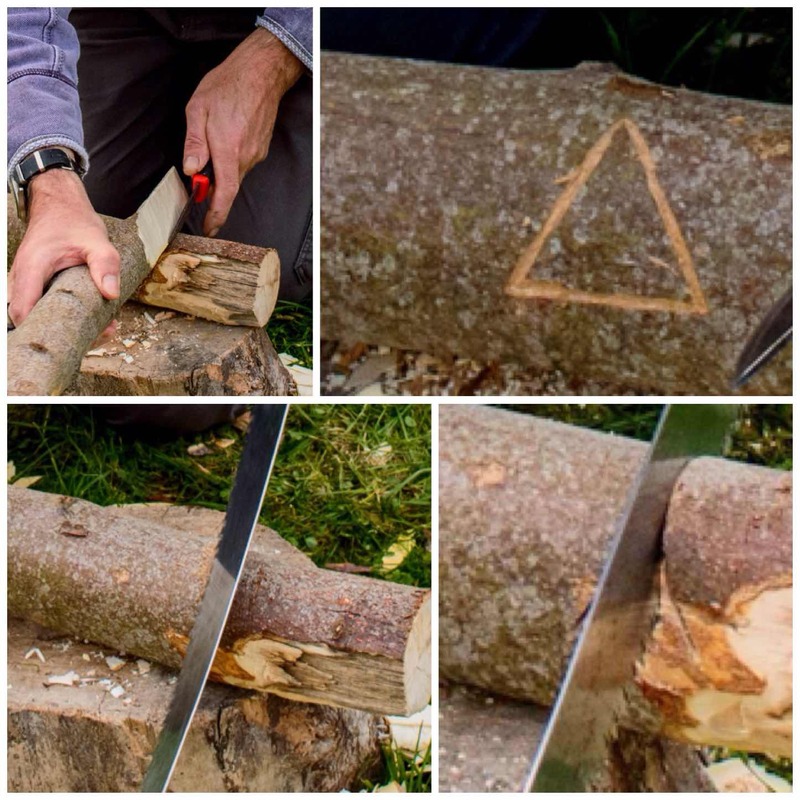 This was to show how easy it was to create an ember using this method with two people on the bow. 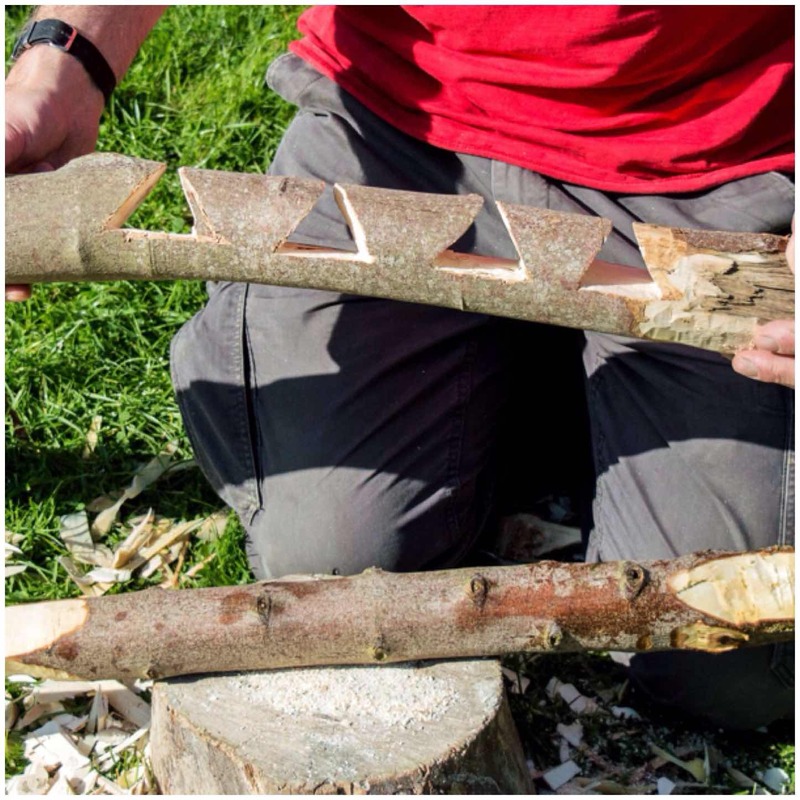 A Master fire maker who has been coming to the moot for years now is Richard (Rich59 on BCUK) and what he doesn’t know about firemaking is not worth bothering about. 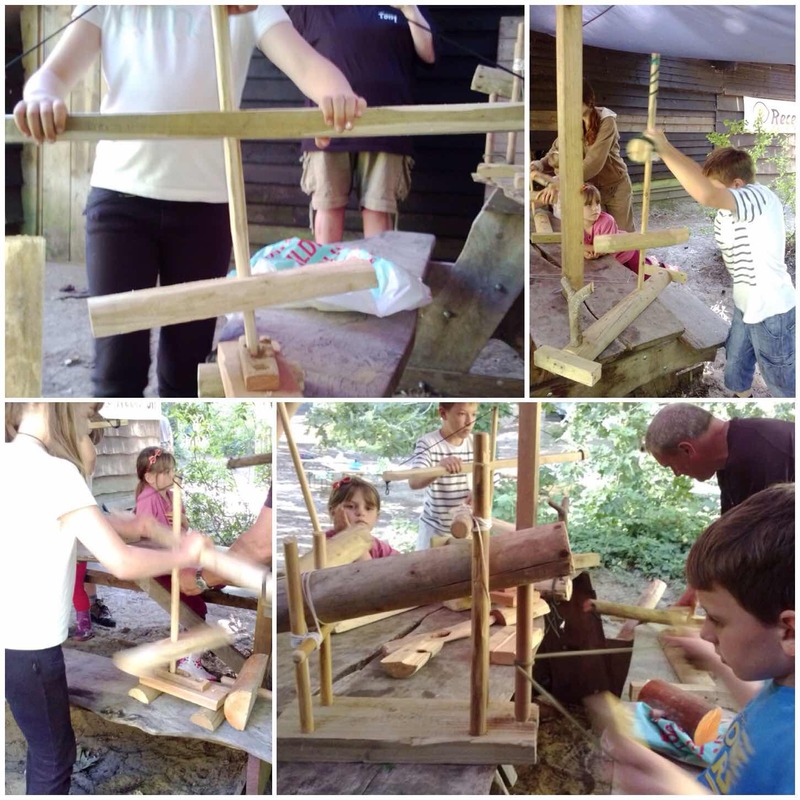 He is an expert with the handrill and regularly brings along a range of woods such as Elder, Teasel, Buddlia, Mullein and Reedmace for students to try out. Richard is a keen experimenter and will try out different techniques like attaching cord to the drill to see if that technique makes life easier for people. This is my short video on using a handrill. 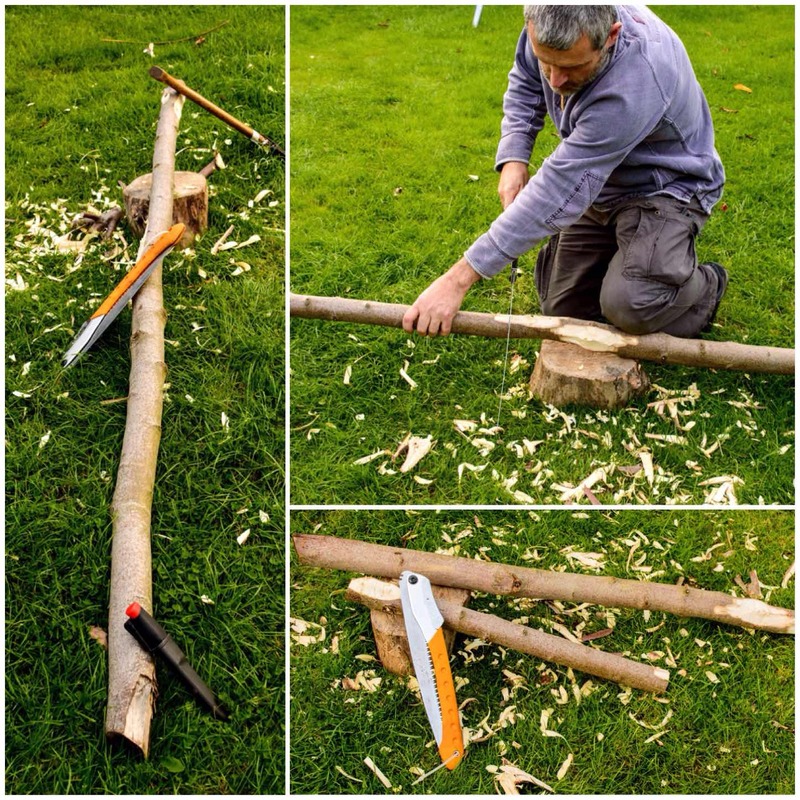 This year Richard experimented with Bamboo Fire Saws. 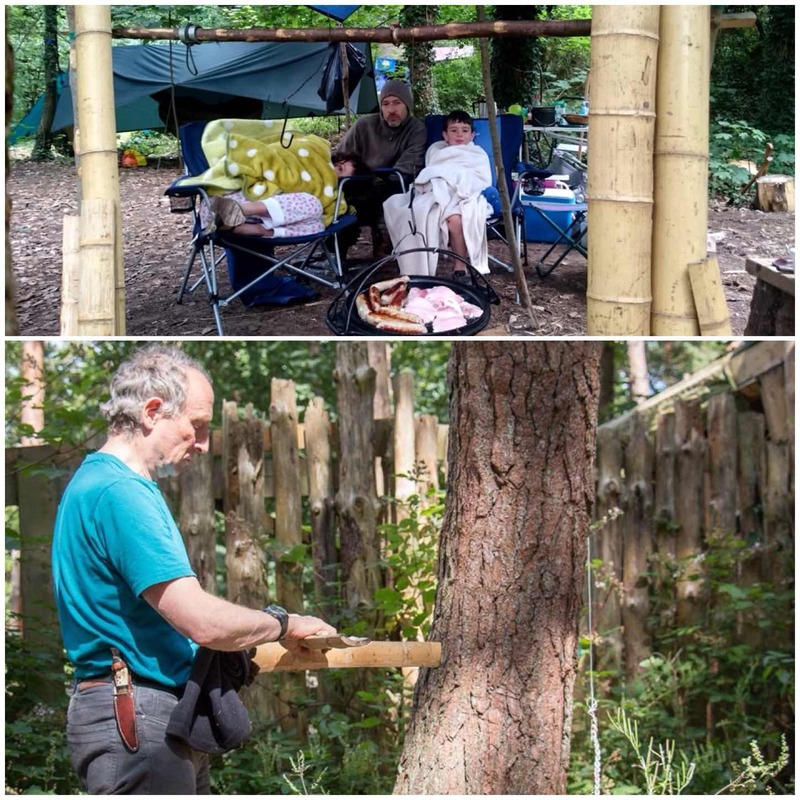 He managed to get some spare bamboo from Wayne Jones of Forest Knights (Wayne was making Bhutenese bows) and we soon had a pile prepped up around our camp. I did not get to see Richards class as I was running one myself but the reports were all positive with successful fires being made, Maybe next year I will make time to see his class. 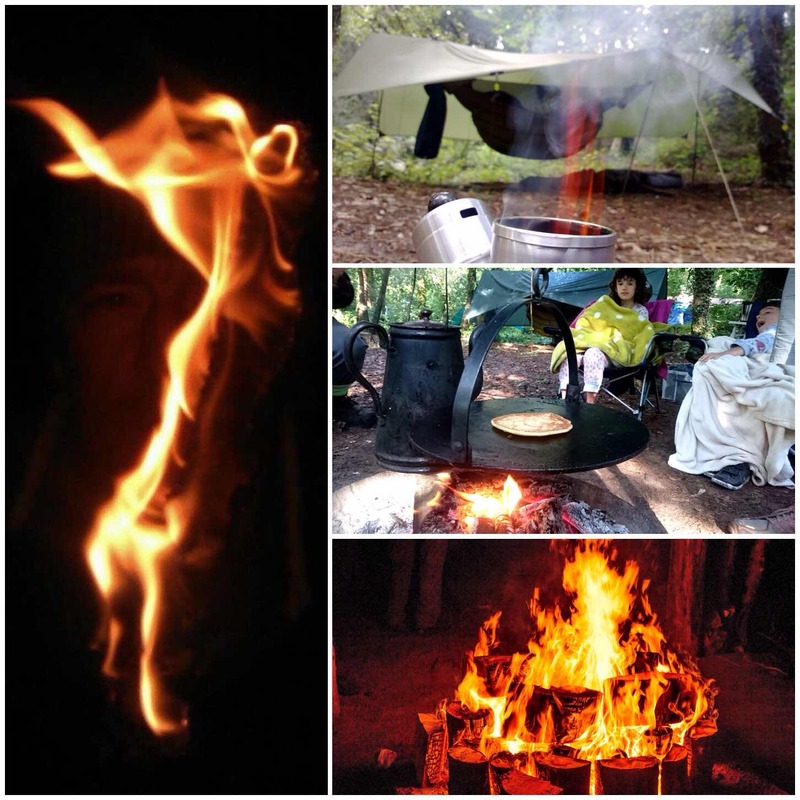 Once you have your ember created (however you do that) it is time to coax that very fragile bundle of hot dust into a fully formed ember and – with the use of whatever tinder you have at hand – to get that much sought-after flame. 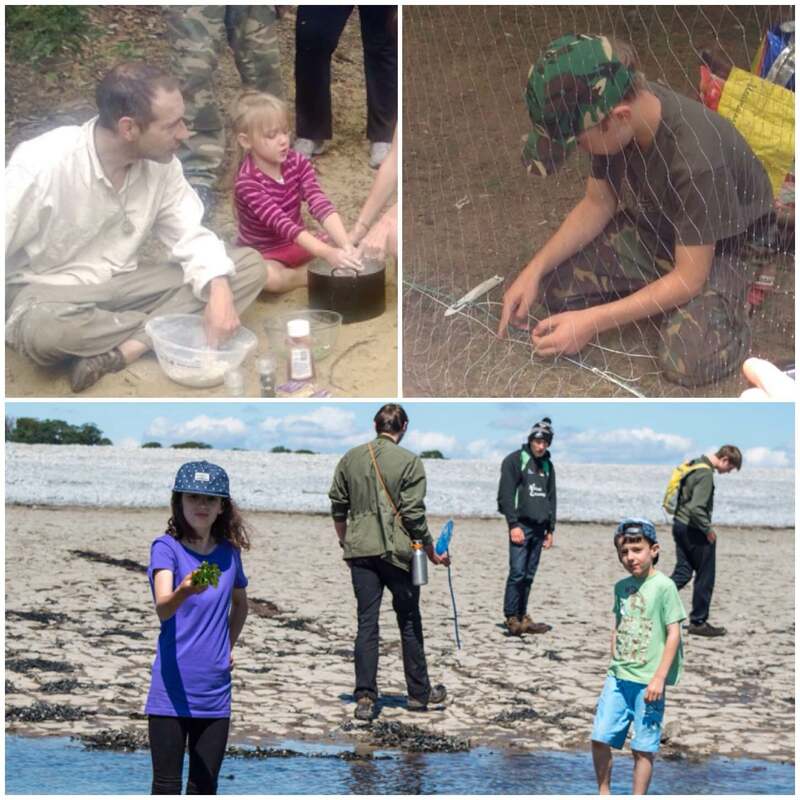 It is at this stage that you can see students’ faces transform from concentration into sheer joy – one of the reasons why I love this subject. Normally you try and find the driest tinder possible to turn your ember into a flame, however Richard turned that idea upside down a few years ago. 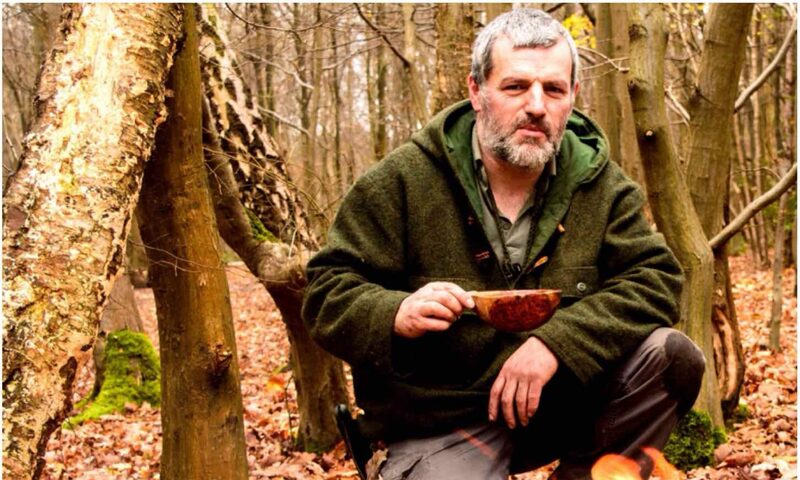 We had a chat one evening around the fire and he explained his idea to me: dimply that it was possible to walk off into the woods and pick up damp dead leaves and process them in a certain way to make tinder to start a fire. After collecting a pile of damp leaves (take the driest ones from the top of the leaf debris) start to break them up by rubbing them vigorously. 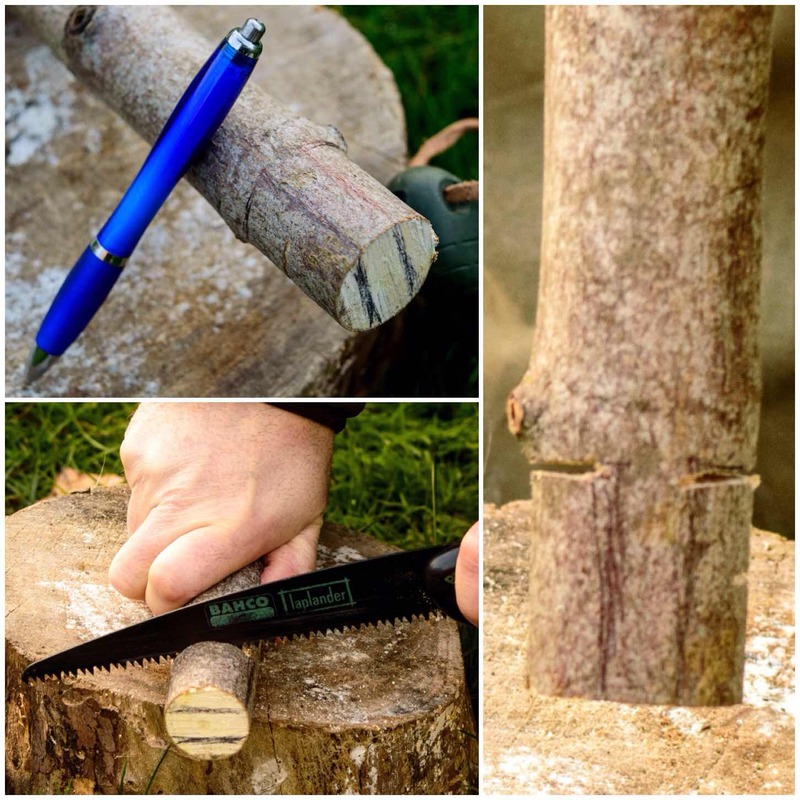 Collect the flaked pieces and grade them from minute up to piles of the skeletal remains of the leaves. From this make a small pile wjth the finest flakes in the centre of your pile. 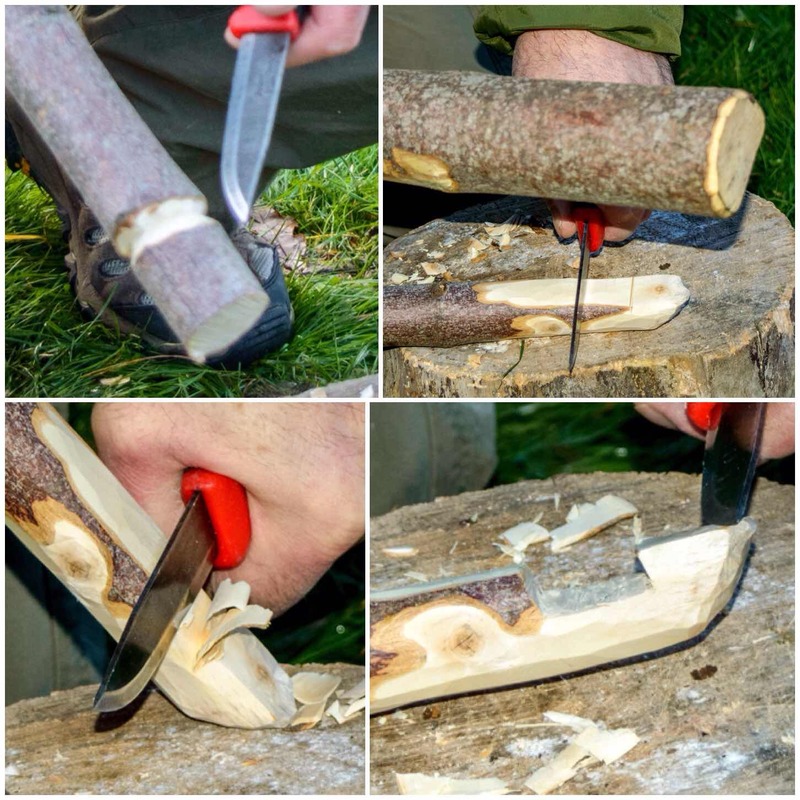 Make a small hole in the side of your pile to the centre and pop an ember (create that in whatever way you wish) and start to blow gently into the ember. The trick is to do this slowly so that you create an ever-expanding dry area. 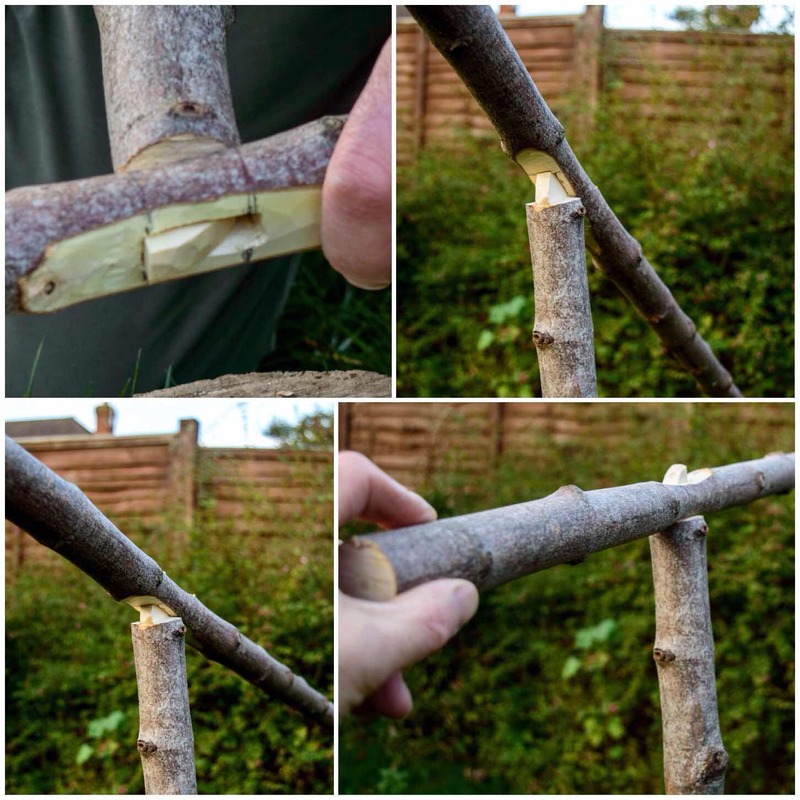 If necessary you can place some green leaves or bark over the top to trap all the broken debris and stop it all blowing away. After about 10 to 20 minutes you usually get flame. Just shows you should always persevere with your fire. 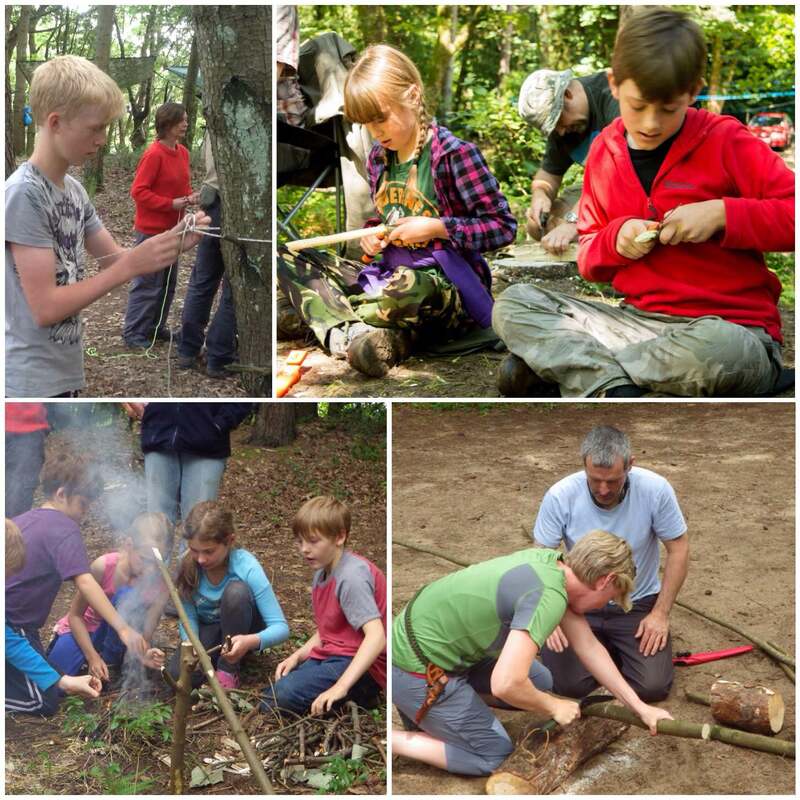 Whether you are a novice to fire making or an expert looking for a new challenge the Moot will have something for you – be that firesteels, bowdrills, handrills, pumpdrills, bamboo fire saws or the secret art of lighting fire from damp tinder. 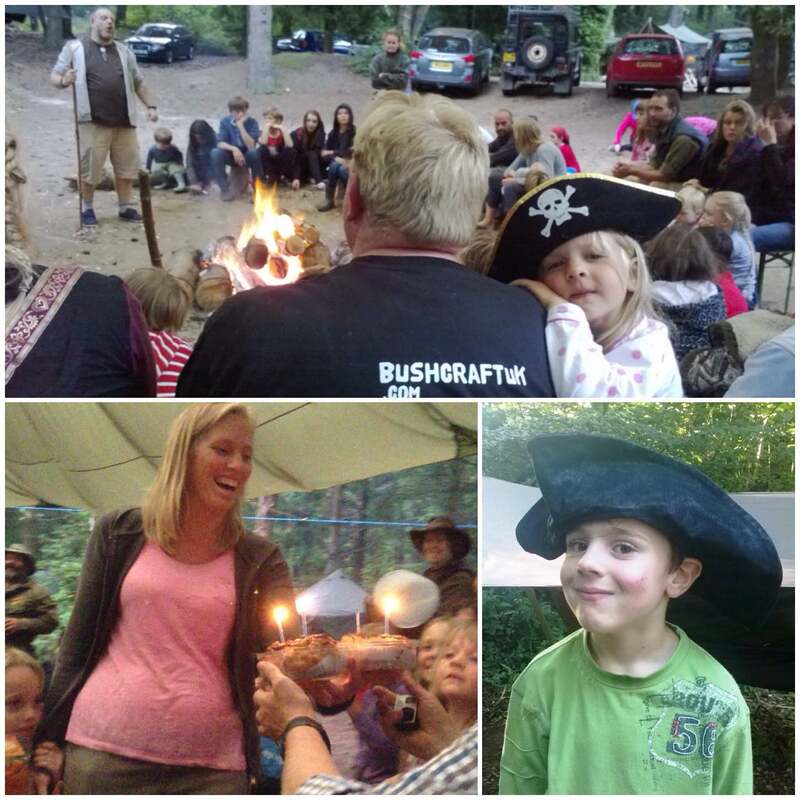 One place where I can really immerse myself back into nature is every year at the Bushcraft UK Bushmoot for a couple of weeks. 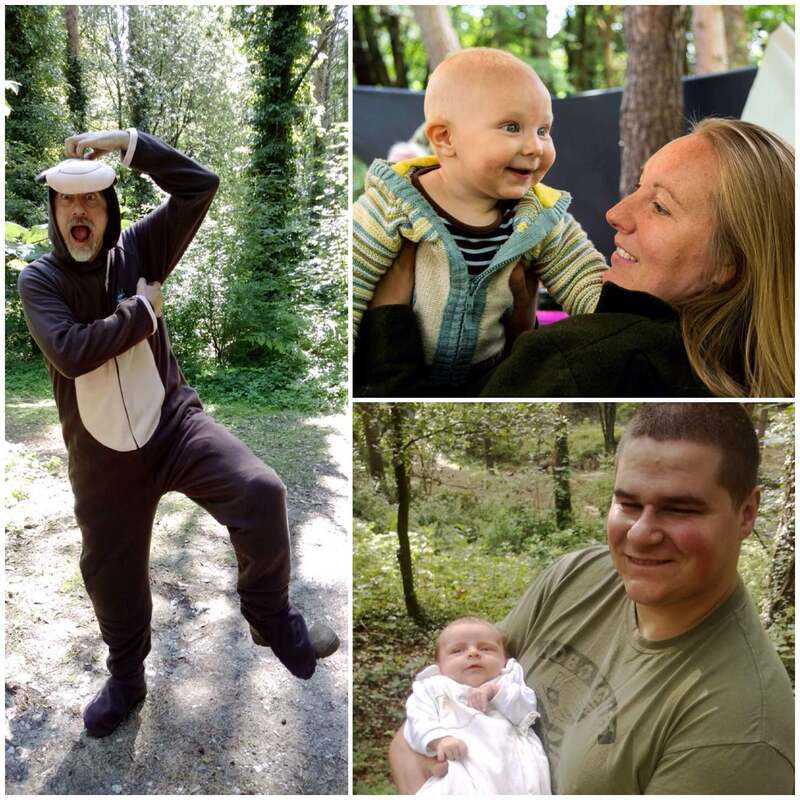 This post will concentrate on some of the different ways we at the Moot interact with nature. 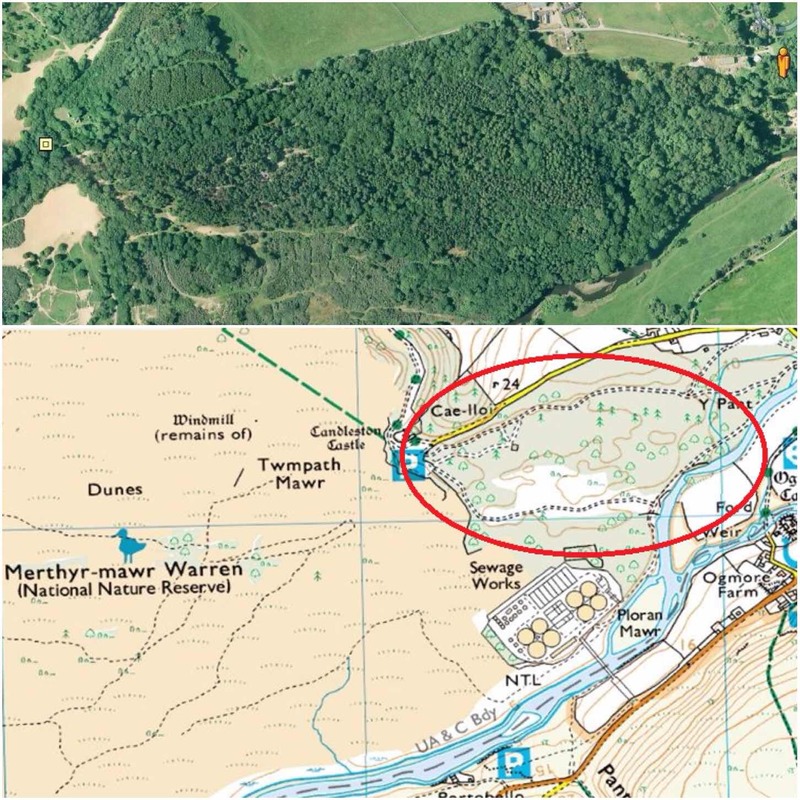 The Moot is located in a wood on the edge of the National Nature Reserve at Merthyr Mawr Warren in South Wales. Merthyr Mawr Warren is I am told the site of the second largest sand dunes in Europe. The wood we use is on the edge of these dunes and was heavily planted with a variety of plants/trees after the Second World War by the local estate owners to help stabilise the dunes. I like to take a walk around the site as often as possible while I am at the Moot to see what I can spot. One of my favourite spots was this little old water wheel at the edge of the site. It is a most beautiful and quiet spot to sit and observe nature. I have a little Robin (Ok I am sure there are different ones every few years) who comes to visit me at my camp. This little fella is not shy and is always on the lookout for scraps. 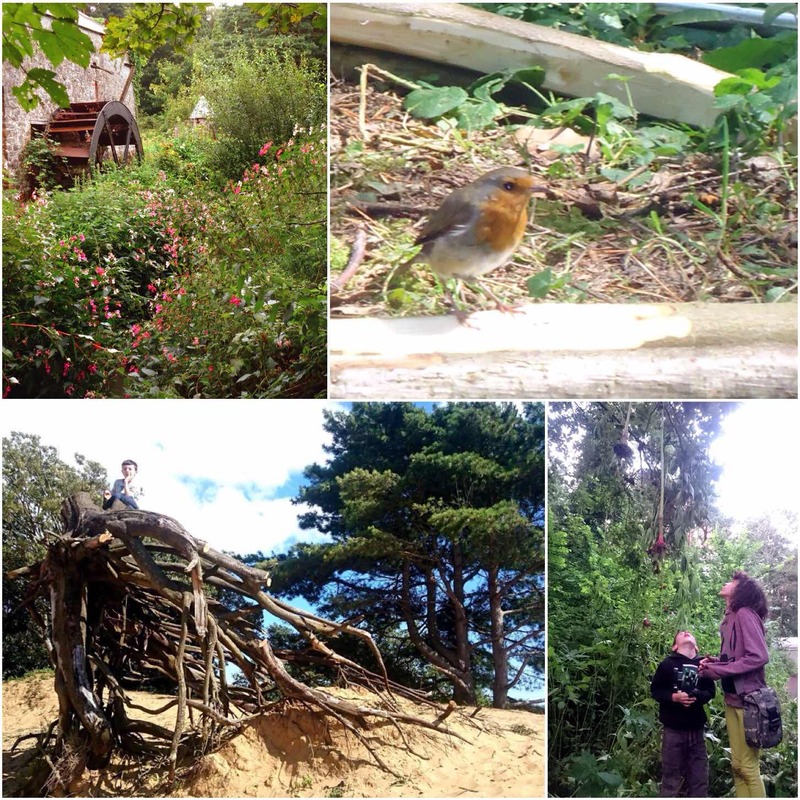 My kids make this site their playground and interact with nature all the time, from climbing strange looking tree roots to making their own art by throwing Himalayan Balsam up into trees so that they hang down (quite a weird site passing these trees). As we are continually clearing back the Balsam I do not mind them doing this. 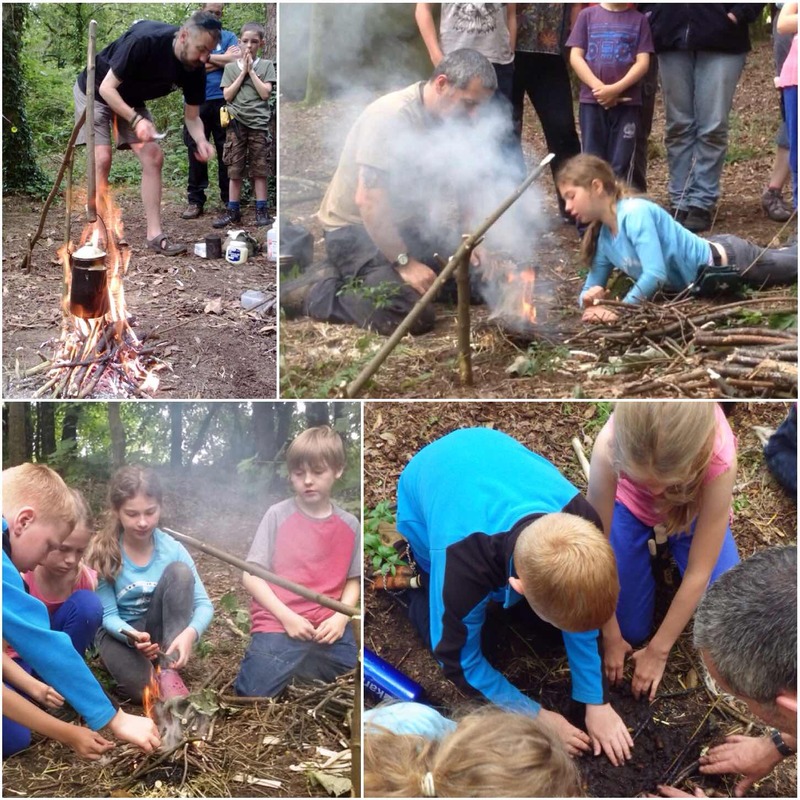 As bushcrafters we try and minimise the impact we have on the site. For firewood we have an agreement with the local estate to buy in timber from them so as to not strip out the local wood for firewood. 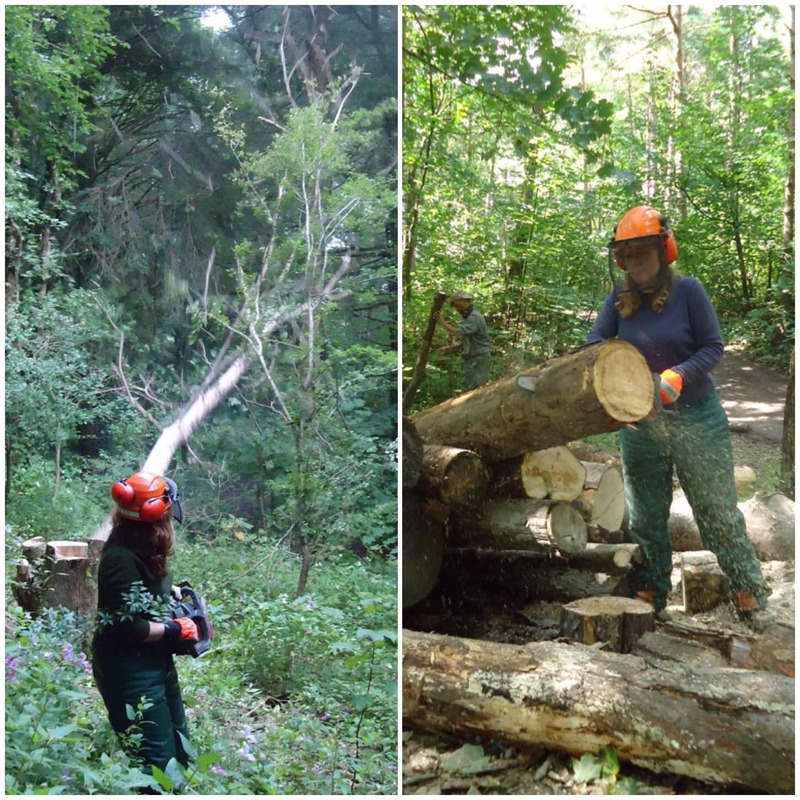 Occasionally with the agreement of the estate we will take out a tree or two that has become a danger to those camping in the woods. 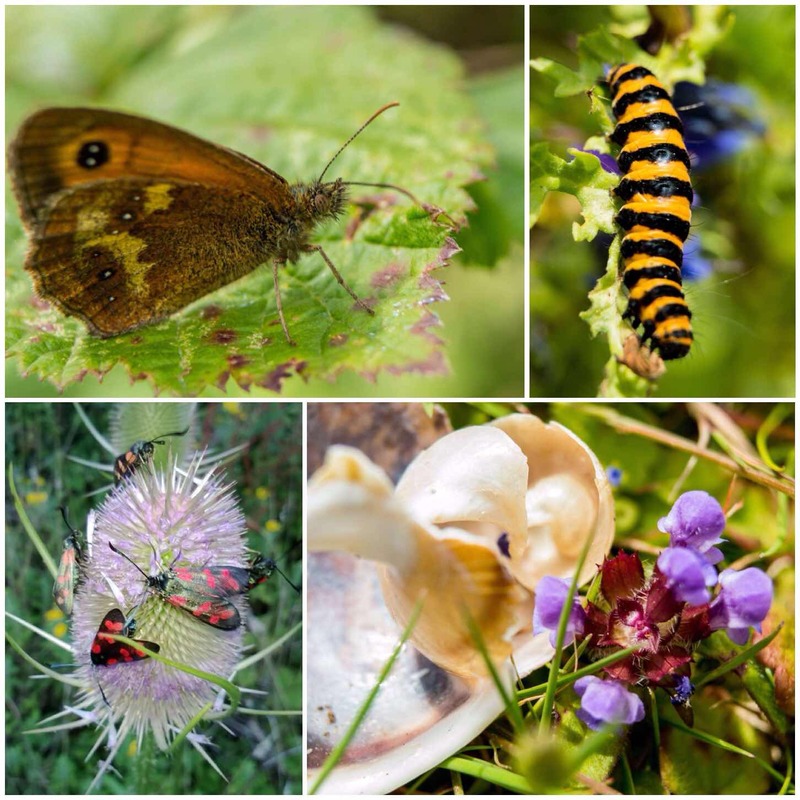 We have been coming to the site for over ten years and this policy of minimal impact has meant that the site remains a place of real natural diversity. 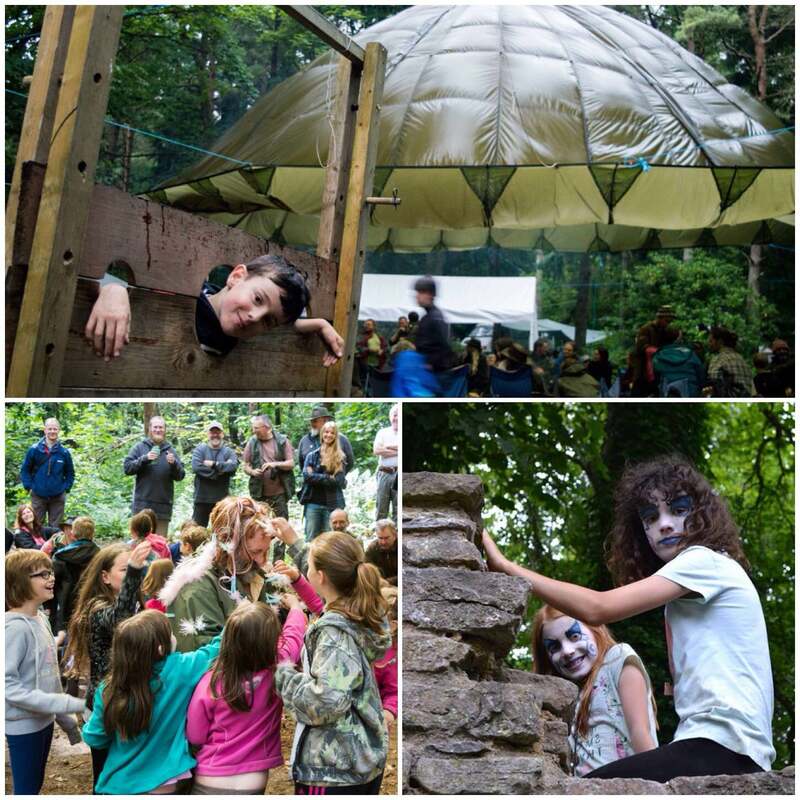 A key attraction that the Moot has is of a place of learning. 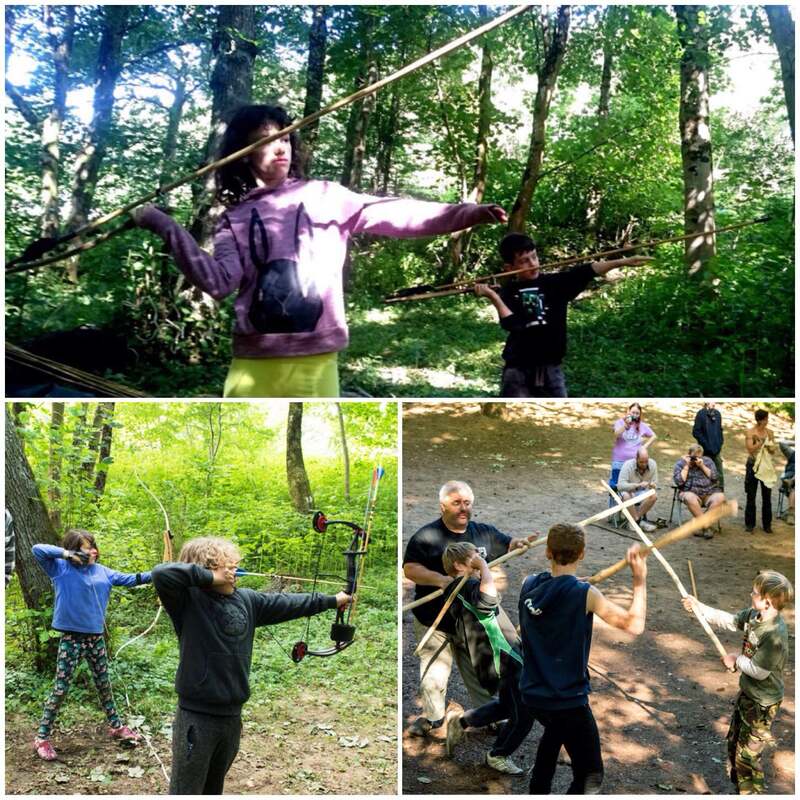 We have many highly experienced instructors that come along each year to teach. 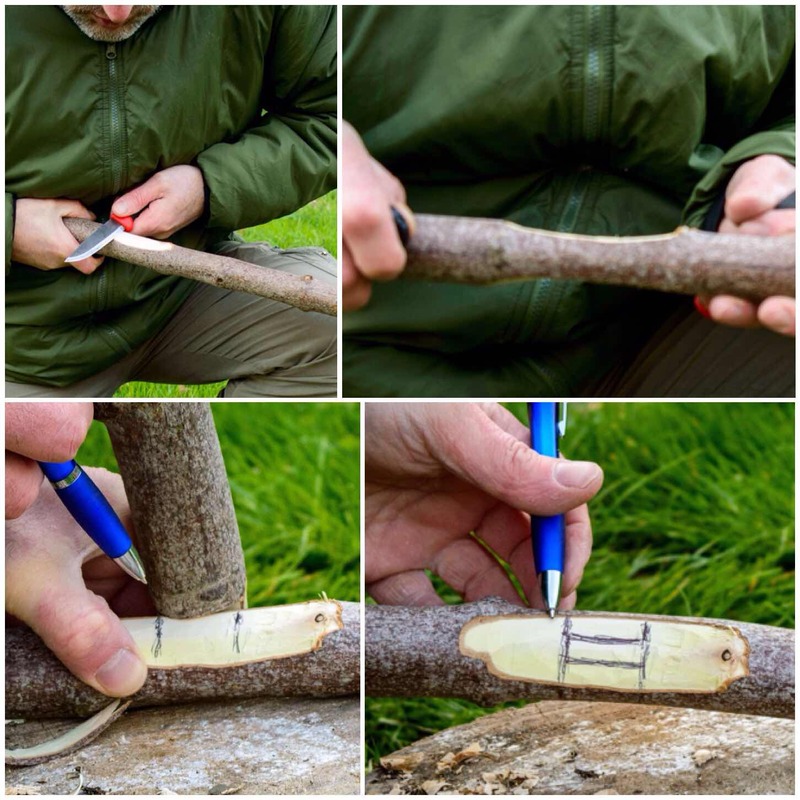 This can range from creating natural art, foraging for edible plants, understanding how everything interacts and using natures raw materials to make useful items. 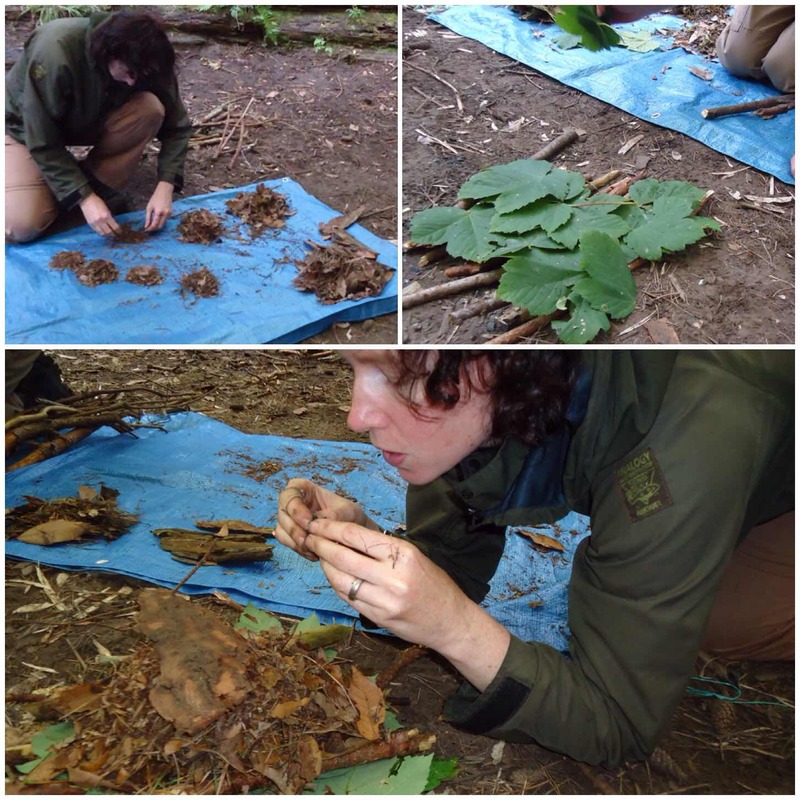 Part of all this learning is to know when to forage and when not to forage. In a class with Fraser from Coastal Survival this year we foraged on the coastline. 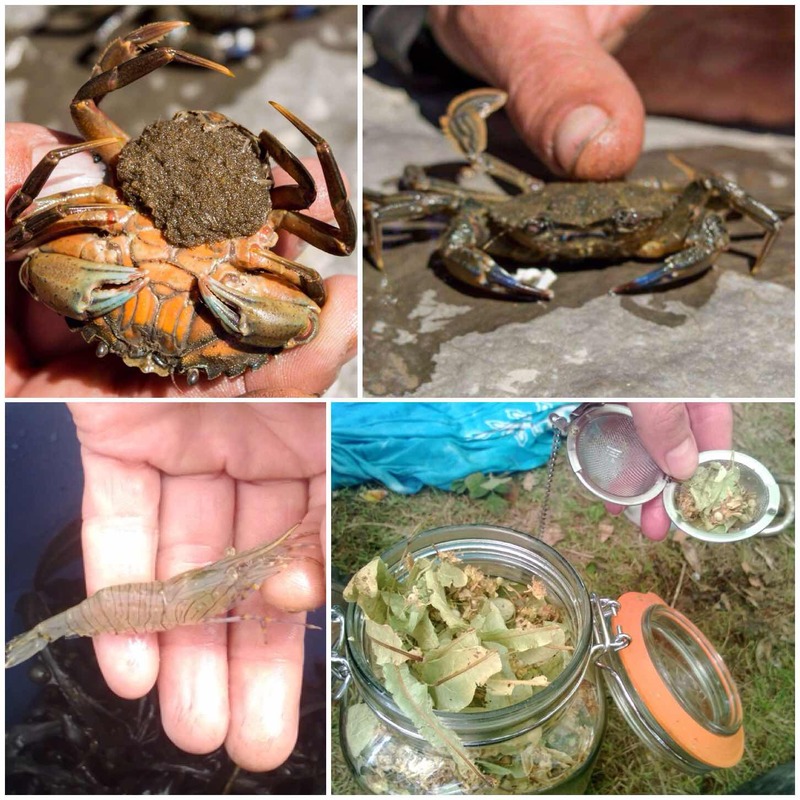 We looked at many of the crabs that could be found in the rock pools and returned the many smaller ones or ones carrying eggs to where we found them. There were plenty of big crabs and shrimps though to harvest for the pot. 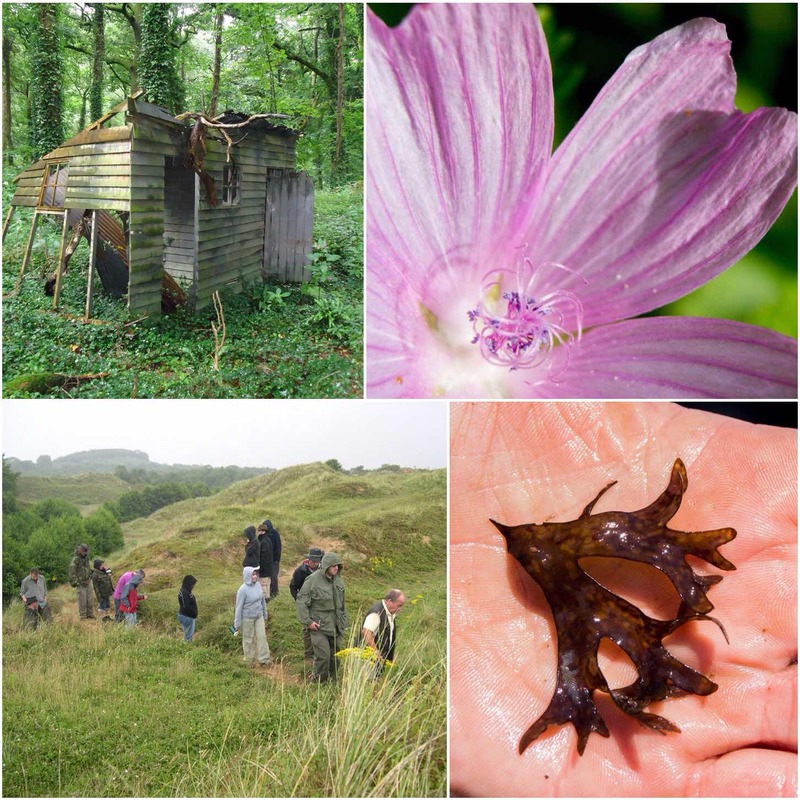 We also forage for lots of plants that make great teas. If you like wild flowers then the Moot is a place to go to see them. 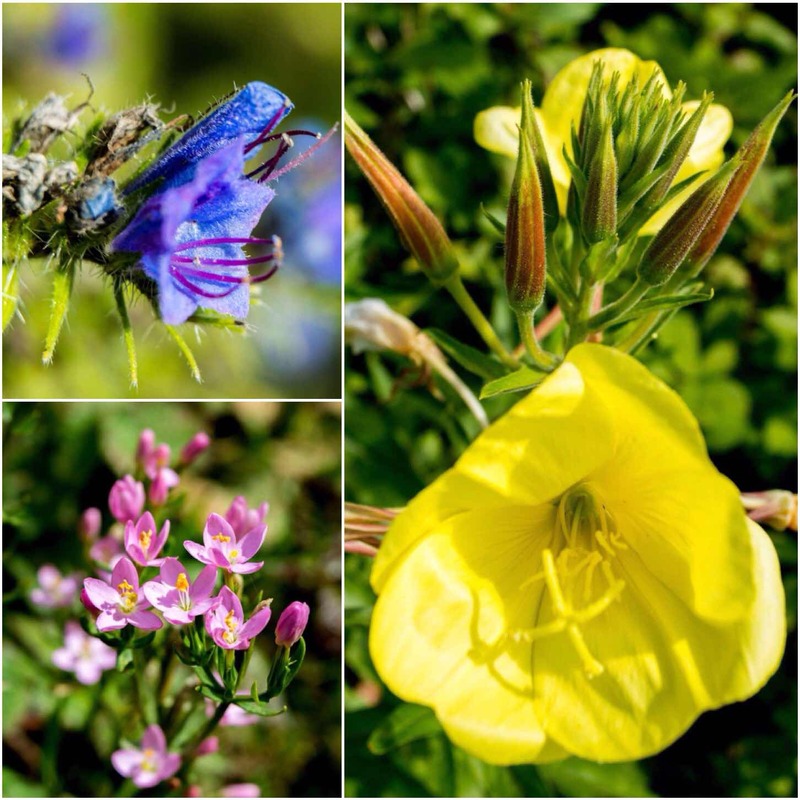 Take a wander along the edge of the wood by the dunes and you will spot some real beauties like the Vipers Bugloss, Evening Primrose and the Common Centaury. 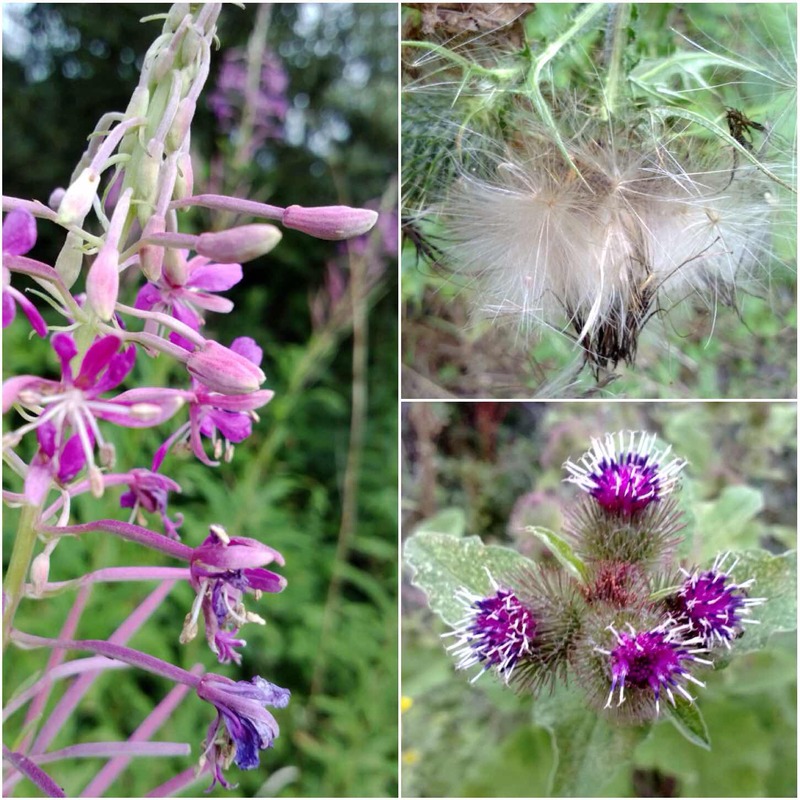 Bushcrafters like to forage plants that they find useful and there are plenty of plants to be found here like the Rosebay Willowherb, Thistles and Burdock. They are beautiful in their own right when in flower but it is for their uses that I look for them. 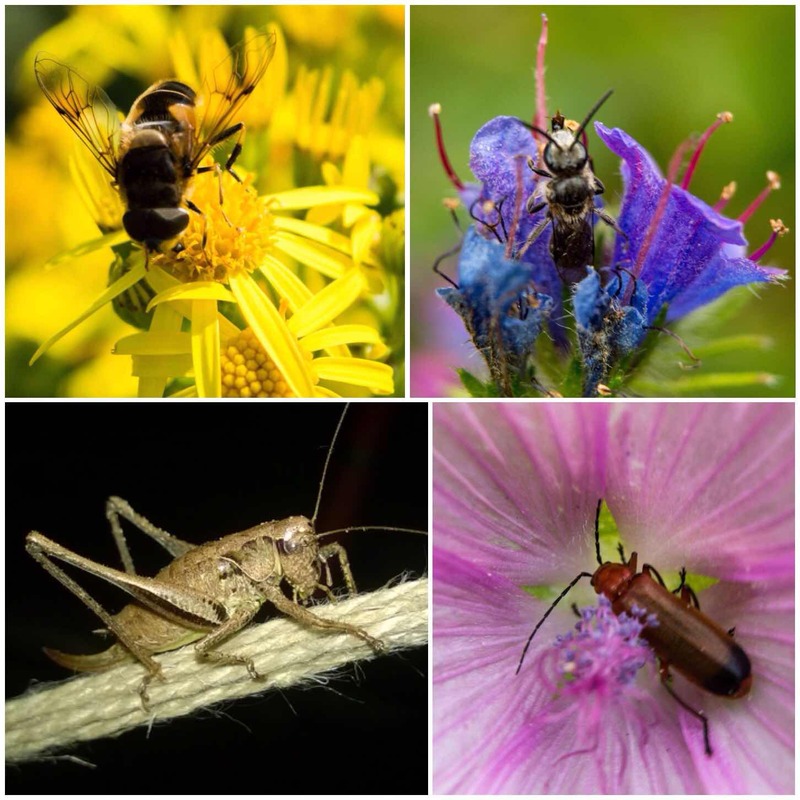 I like to do a bit of Macro photography from time to time and there is plenty of scope to do this at the Moot with plants and insects. Below are just some of the shots I have taken there recently showing the cycle of life. Below you can see the lovely stripes of the Cinnabar caterpillar, the delicate features of what I think is a Meadow Brown Butterfly sunning itself, the busy life of the feeding Six Spotted Burnett to the beauty of a discarded snail shell. 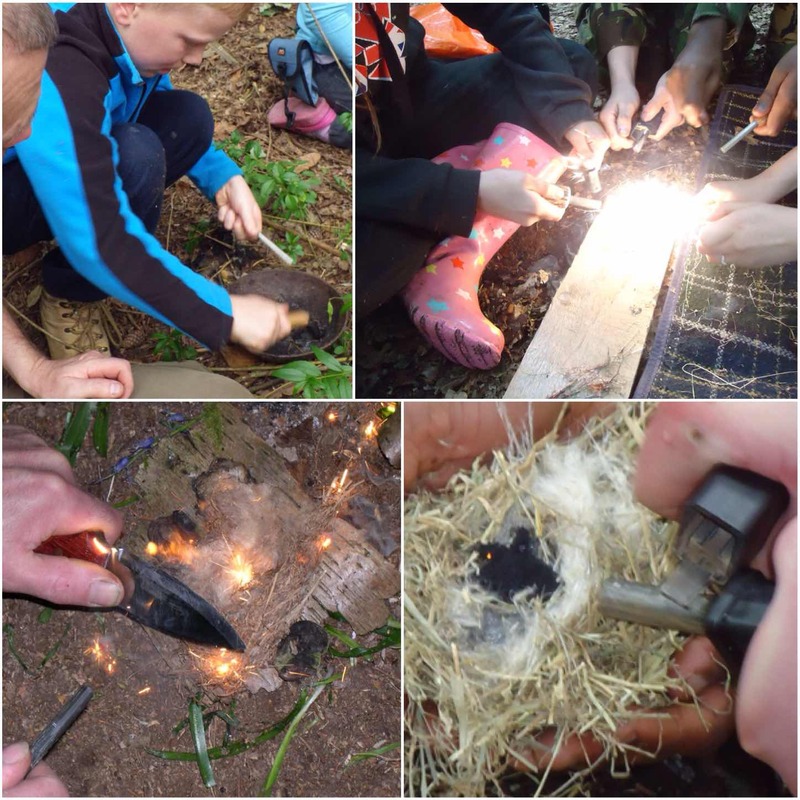 Children and adults can be put off by insects however with a little bit of play and observation you can soon learn to live alongside insects. My daughter had a real dislike of wasps before coming to the Moot but now is quite intrigued by them. 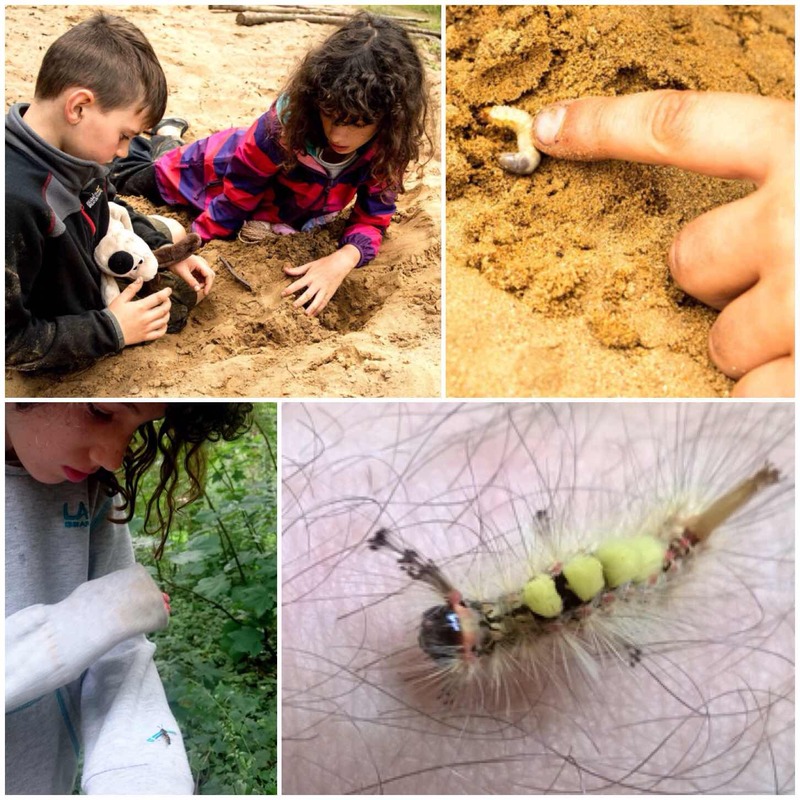 The caterpillar you can see in the bottom picture dropped onto my friends arm one day. He was quite beautiful to look at but thankfully not poisonous in any way. I love to photograph insects and they come in many forms at Merthyr Mawr. 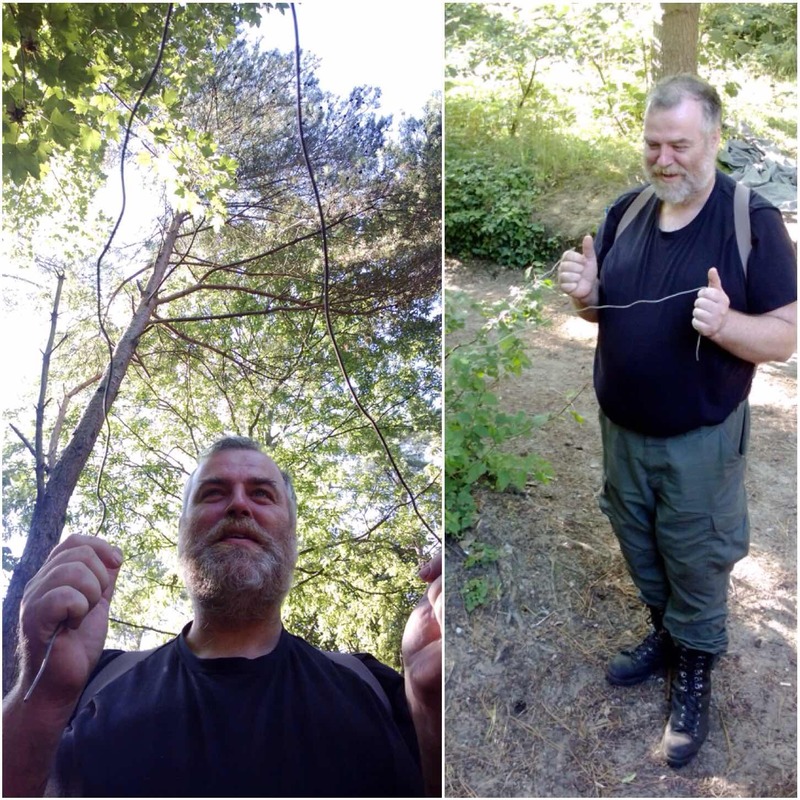 A skill I learnt a couple of years ago from Perry McGee of the National Tracking School was the art of Dowsing. 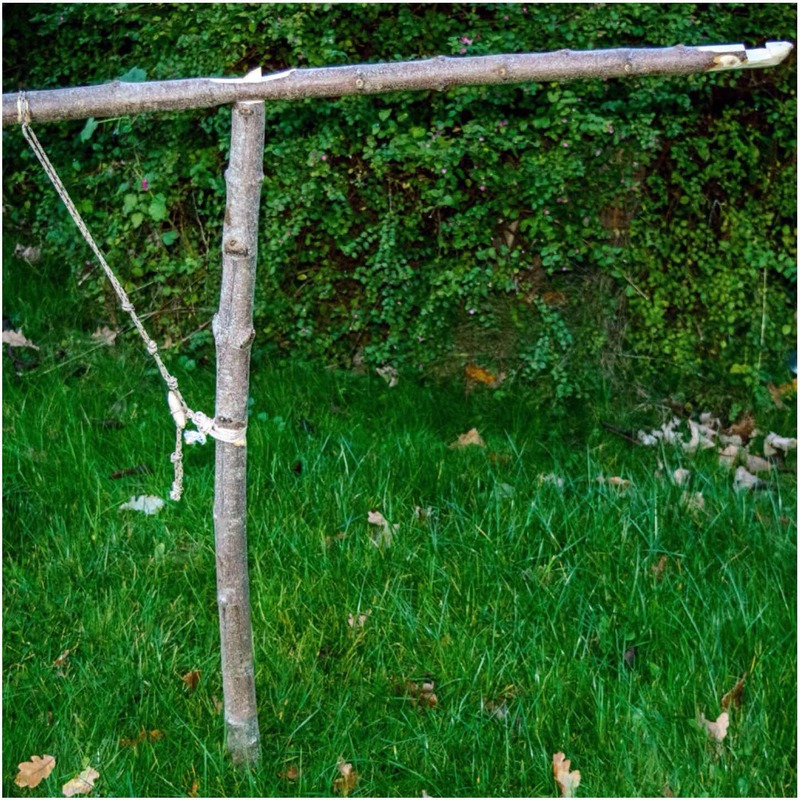 Perry taught me this in minutes and I was able to located water sources and even follow a buried hose. I do not know how this really works but it is a force of nature that intrigues me. 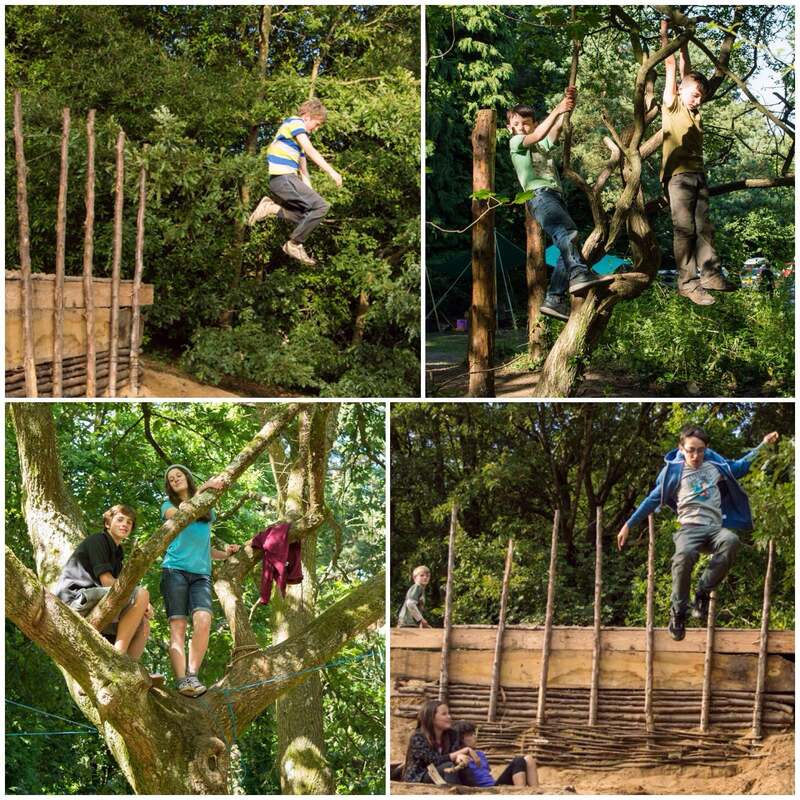 Whatever interests you about watching or interacting with nature the Moot is a place to do that. I love to photograph what I see and I have found a great place to do that at the Moot. A big part of any Moot is food and at the BCUK Bushmoot it comes in all forms. Looking back over the pictures I have taken I was quite staggered at the range of food you can find at the Moot. I cannot profess to being any sort of cook (I prefer to build cooking constructions) however I appreciate good food when I see and smell it. Many years ago at the Moot I would help out with teaching how to butcher rabbits and pigeons so that they were ready for the pot. 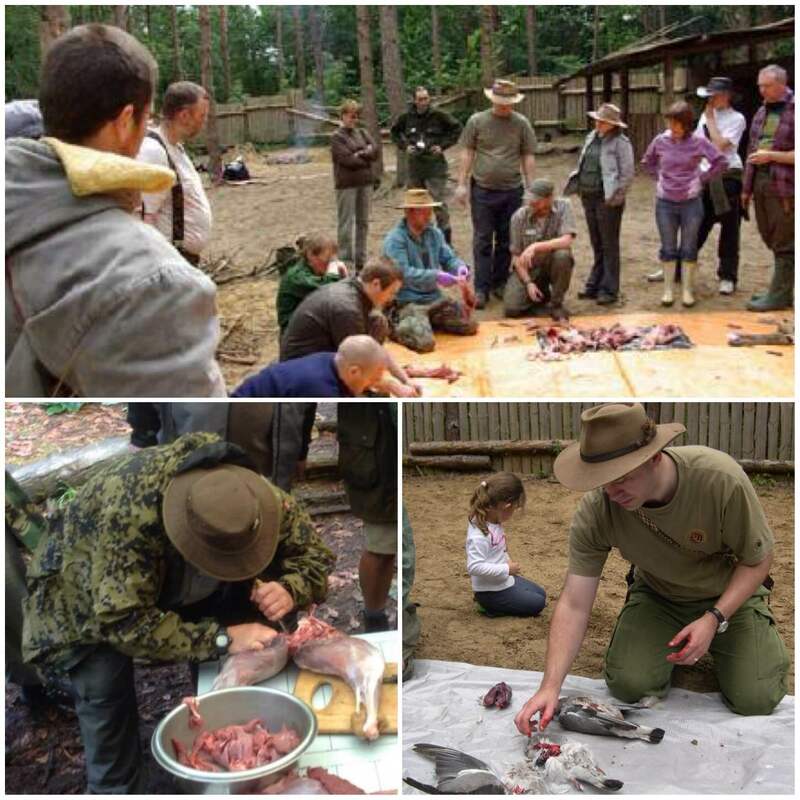 Many of the instructors at the Moot will do these classes and each year you are bound to find a class going on somewhere preparing some meat stuffs for the pot. I leave the butchering of Deer and such like to some of the members more competent in this field though I could quite happily run a class if I had to. 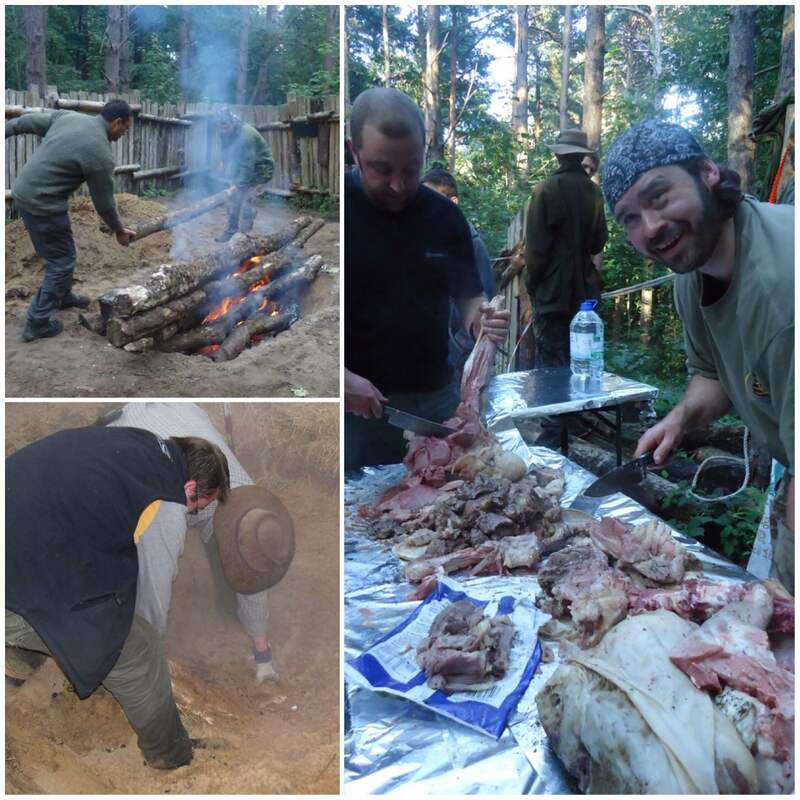 Up until a few years ago at every Moot we had a Hangi – an underground oven. A large pit would be dug in the sand and it would be lined with non porous stones (to avoid stones exploding). A large fire would be lit above it and kept going for a few hours. 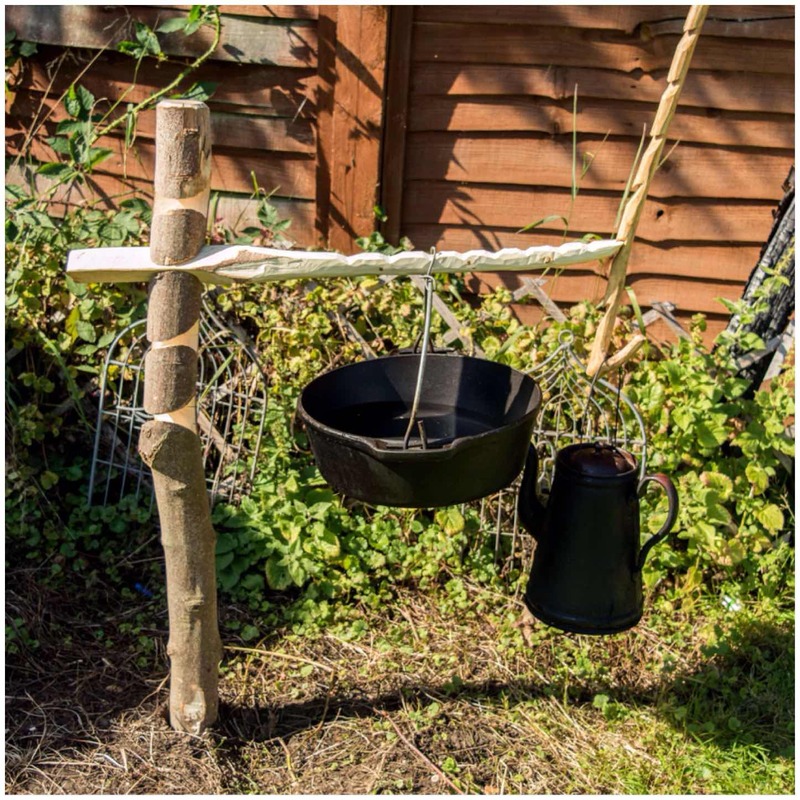 Once the fire died down pre-prepared food parcels would be placed on the hot stones and covered in sand and hessian to slowly cook. The Hangi has not been run for a few years as it has been superceded by Ponnassing. 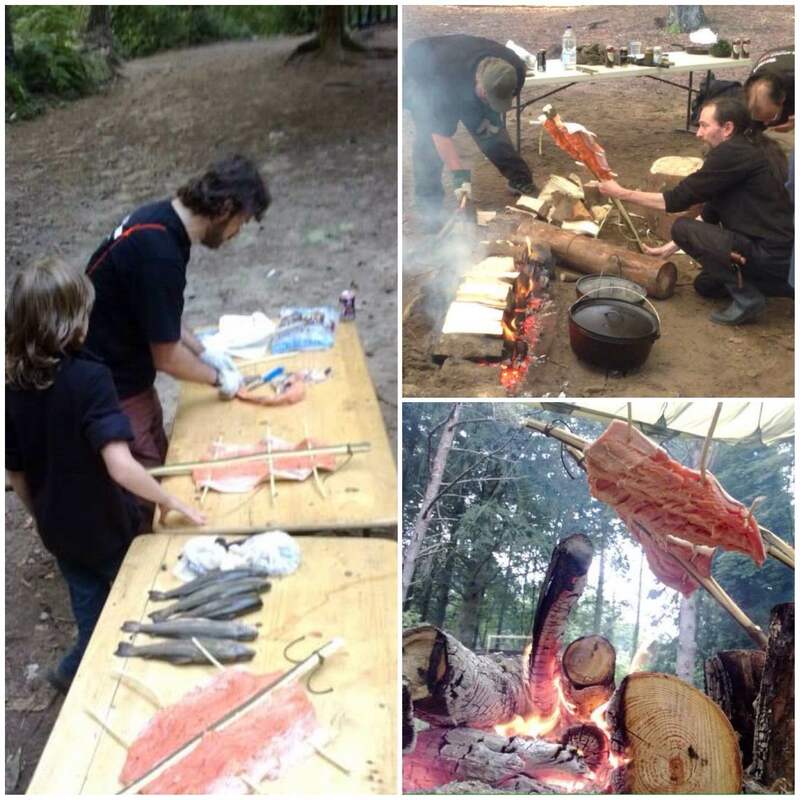 We try to buy in some salmon or other similar large fish and cook them as you see below over an open fire. 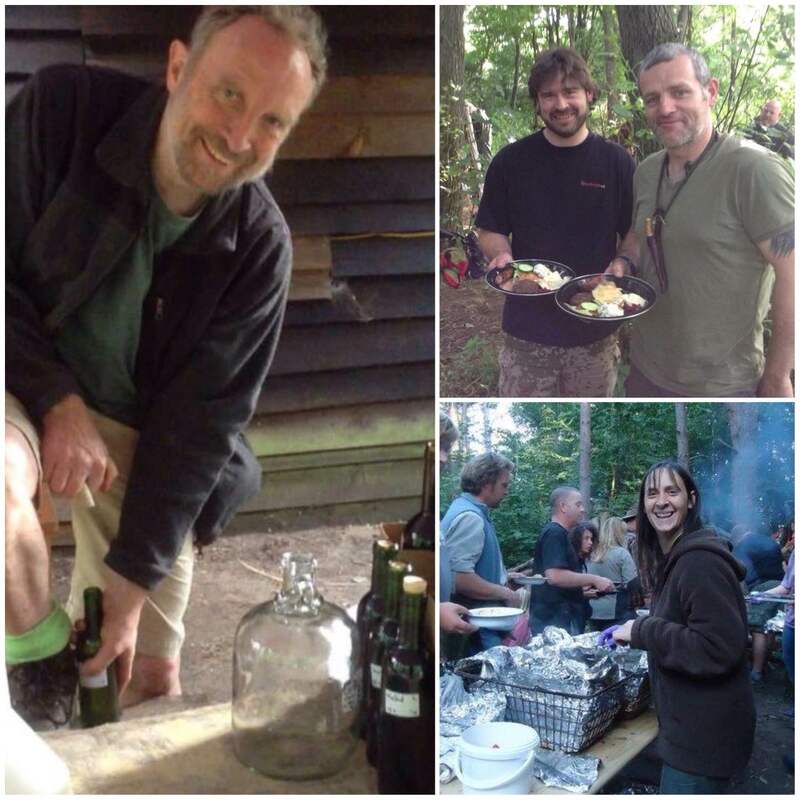 In the picture below at the top right you can see some Dutch Ovens that Neil was using to cook some food. 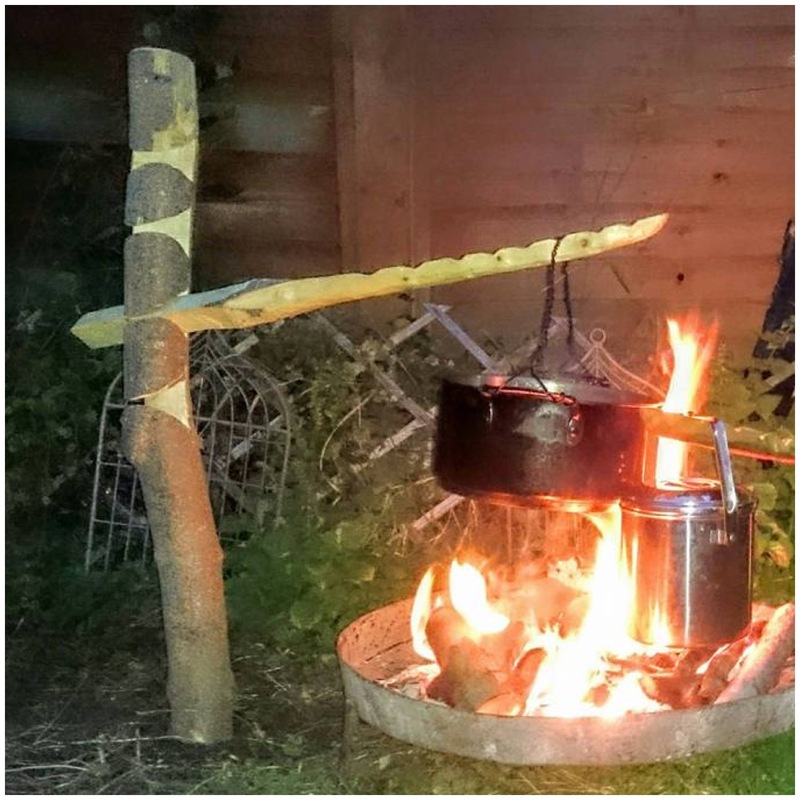 Neil creates such an intense fire that the pots with regular turning can be used as cooking vessels without being on the actual embers at all. The Ponnassing did not happen this year because of difficulties in getting fish however I hope it will be back on the menu next year. All the fish when it is cooked is added to the group meal. About five years ago we introduced to the group meal some Dutch Oven food. 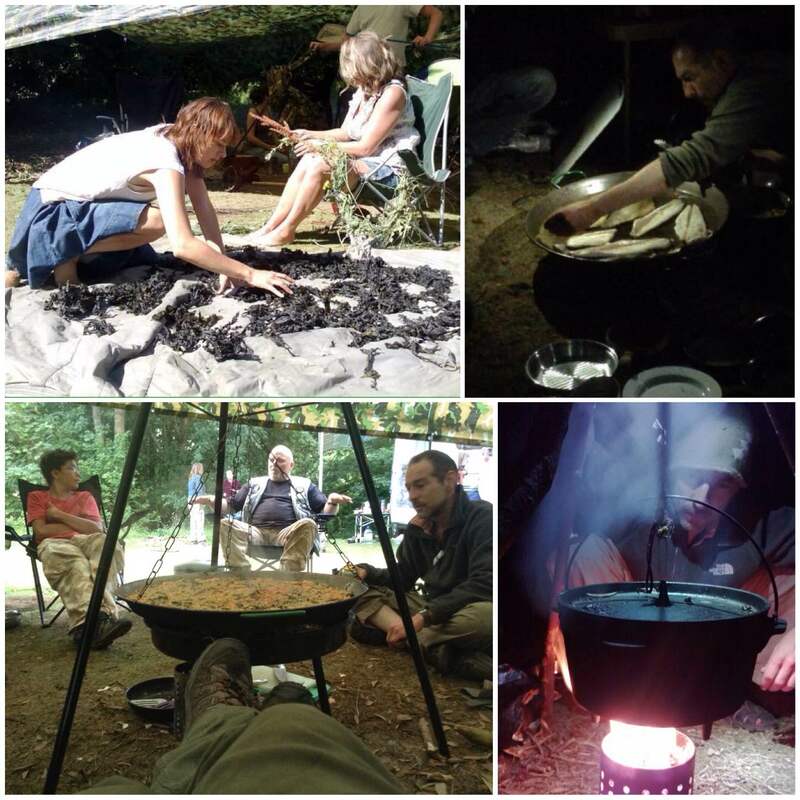 Many of the members of the Moot cook a meal in a Dutch Oven (or similar type of pot) and bring it along to the group meal. Each dish is clearly marked with its ingredients so we do not get any allergy issues. The queue for this meal is massive with everyone looking to get a taste of something new. 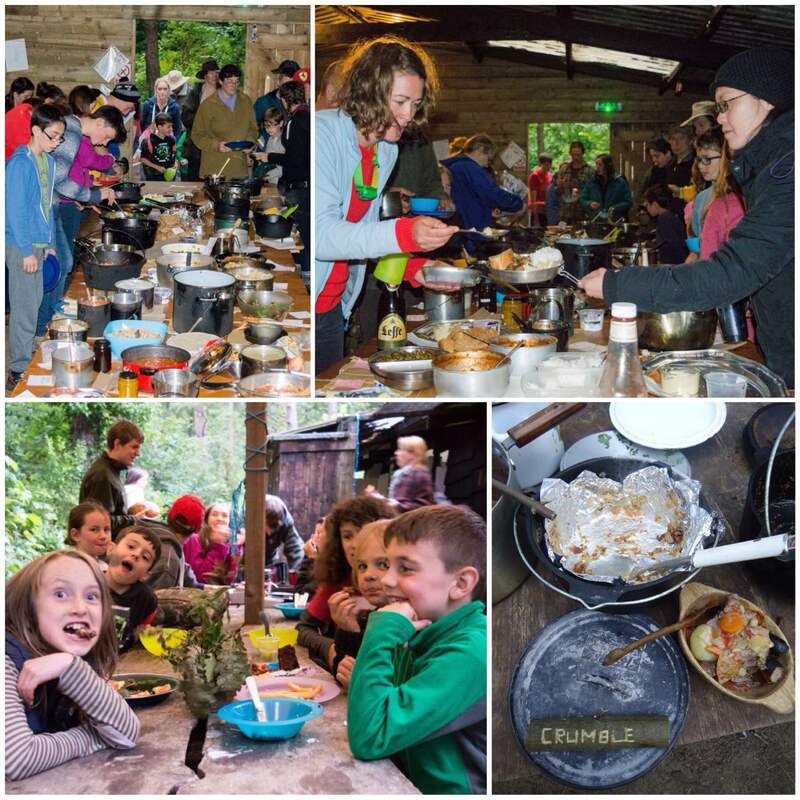 I am always amazed at what people can produce over an open fire – a real banquet is produced each year. Baking is something I love to do around the campfire. At the Moot it happens all over the place. The baking classes can be over subscribed so we usually have a number of instructors running classes. Everything is covered from simple twizzle stick bread, dampers, loaves, rolls and even cakes (cheers Ian Woodham for the cakes). 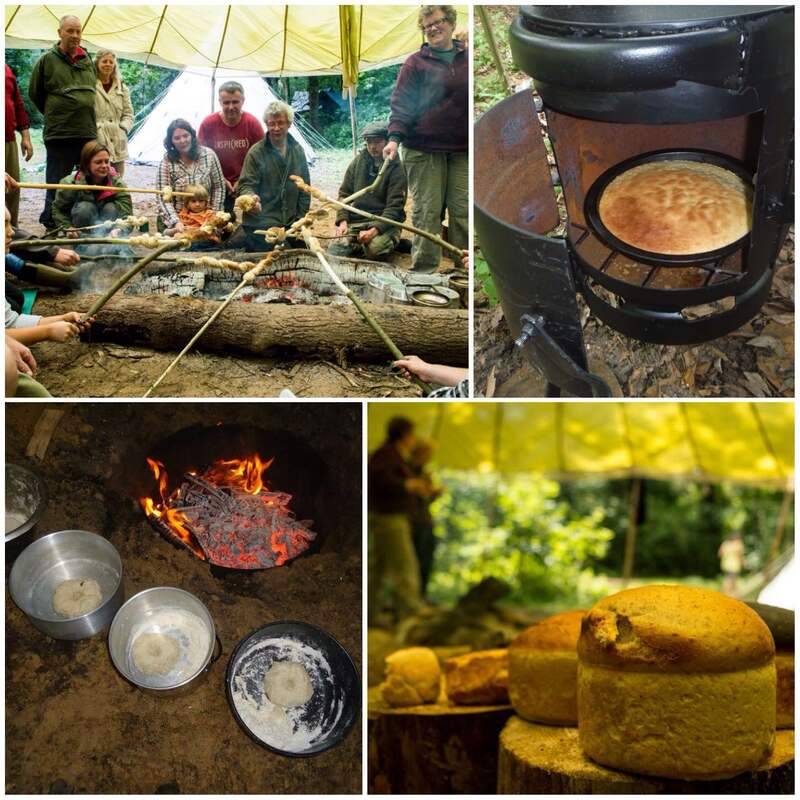 I love the look on someone’s face when they open up a pot and look upon their first loaf baked over an open fire – about as magical as when you create your first flame from a bowdrill. 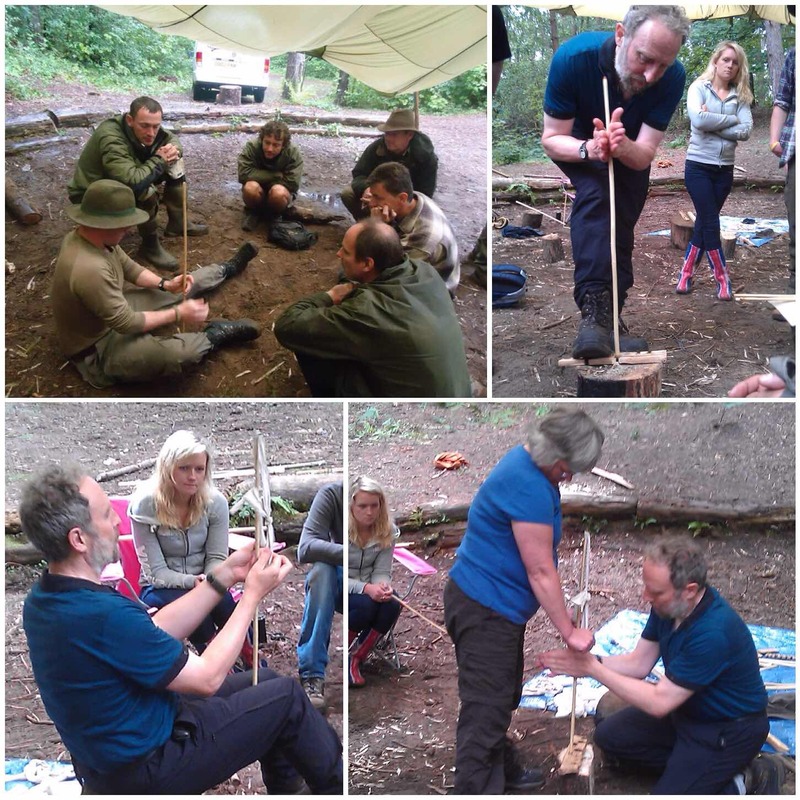 My friend David Willis (Bushcraft with David Willis) ran the class you can see in the picture below and it was enjoyed immensely by everyone. As I said I do not do much cooking at the Moot and that is because I am rather spoiled by certain friends. For example my friend Fraser Christian (Coastal Survival) is a top rate chef and loves to cook. 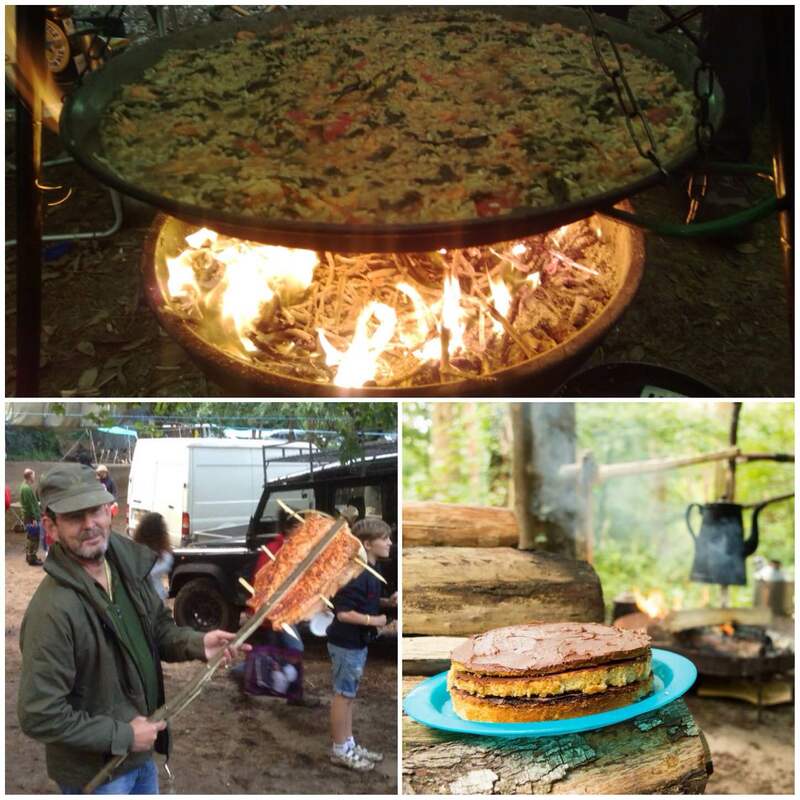 Fraser likes to forage on land and sea for his food and then to cook rather amazing meals. I have no wish to upset that routine so I am happy to help out in the gathering and cooking process with the ultimate aim of getting a fantastic meal. 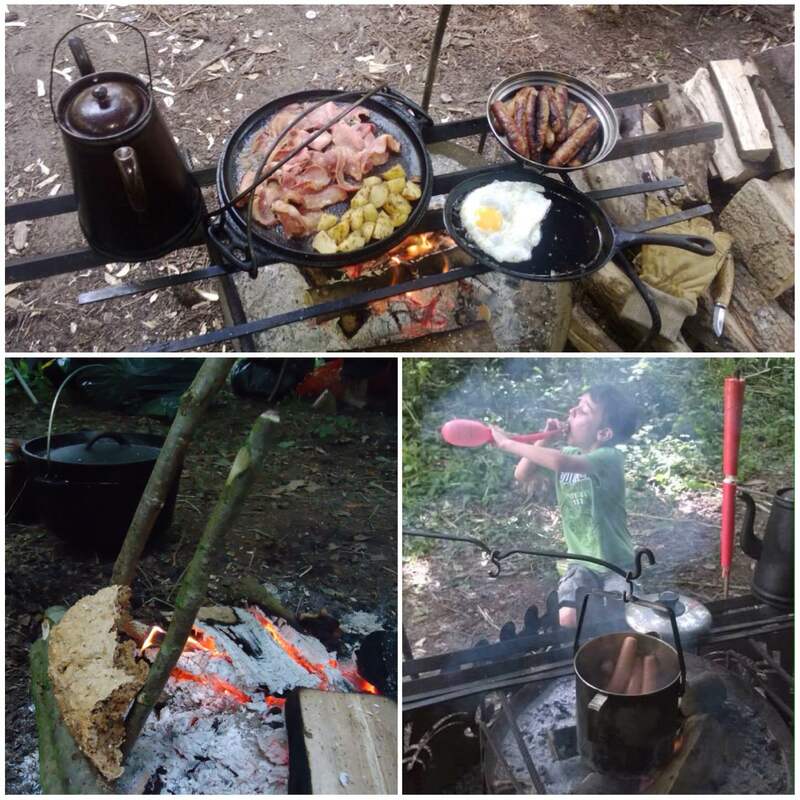 For many years at the Moot I would come along on my own and so would keep my own cooking fairly simple (whenever I could not cadge a meal off someone else). Over the last couple of years my family have started to come along so I have to start to think about cooking a bit more. Looking at my pictures I came across these ones from my friend Mark Oriel who is a butcher by trade. One year he managed to spit roast a whole pig which went down a treat with everyone. 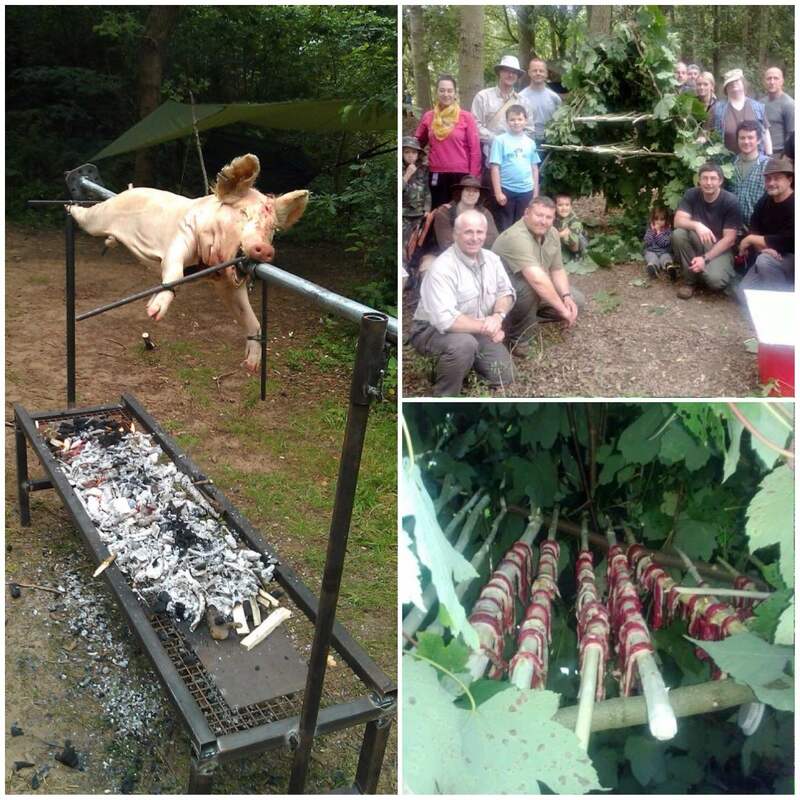 He also ran an excellent class building a smocker in the woods so as to preserve different meats. 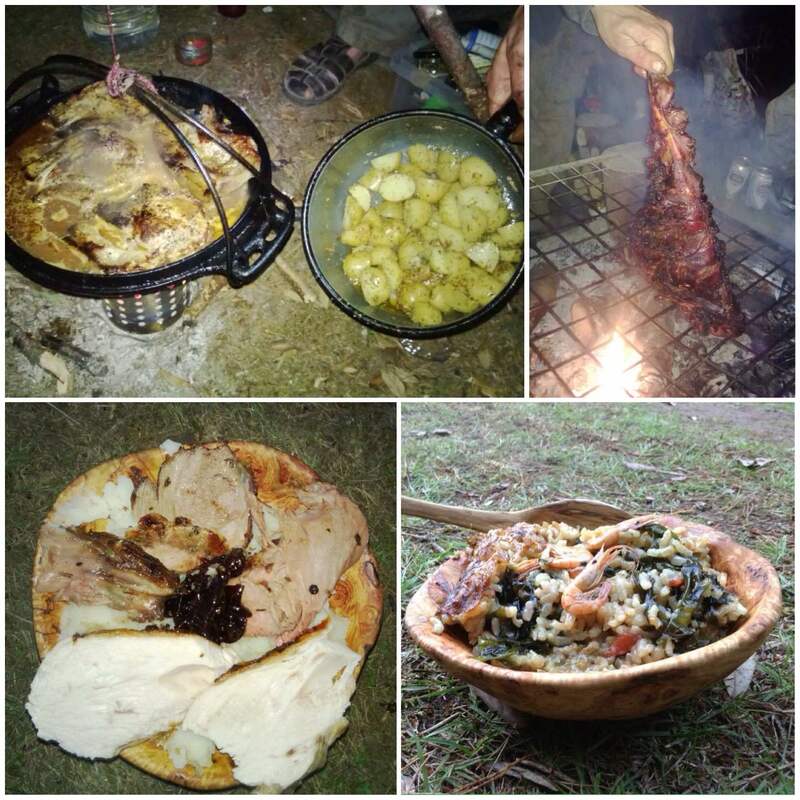 One thing I have learned coming to the Moot is that Bushcrafters do not generally tend to go hungry – quite the opposite could be said in truth. To make all this happen you need people with different skills. We come together and share these skills to make some truly memorable meals in what many others may say is an inhospitable environment – we just call it home. 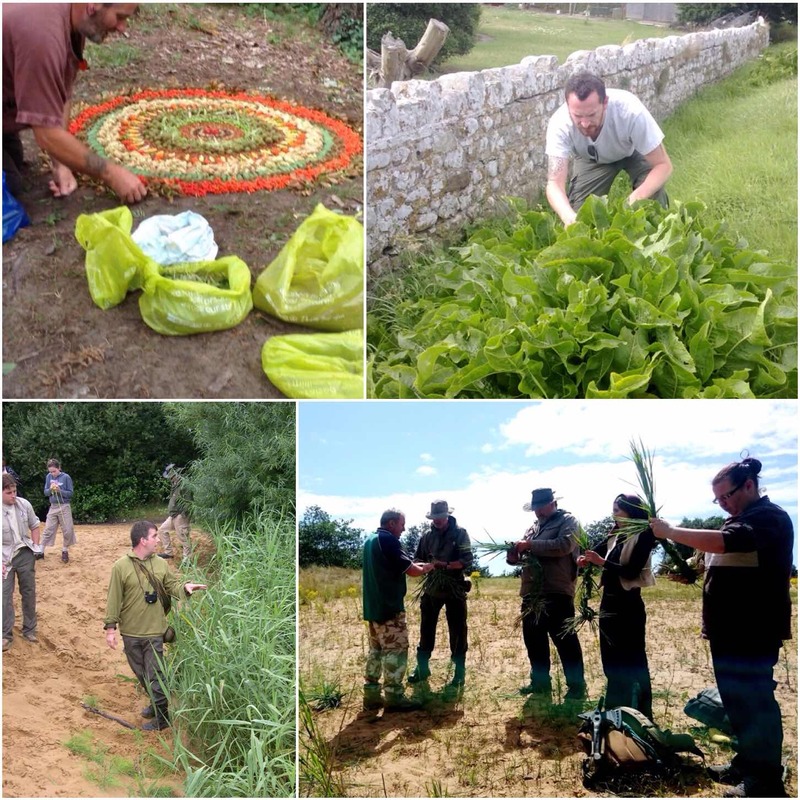 There are many other classes going on in terms of cooking and foraging so the best way to see what is on offer is to come along to the Moot. 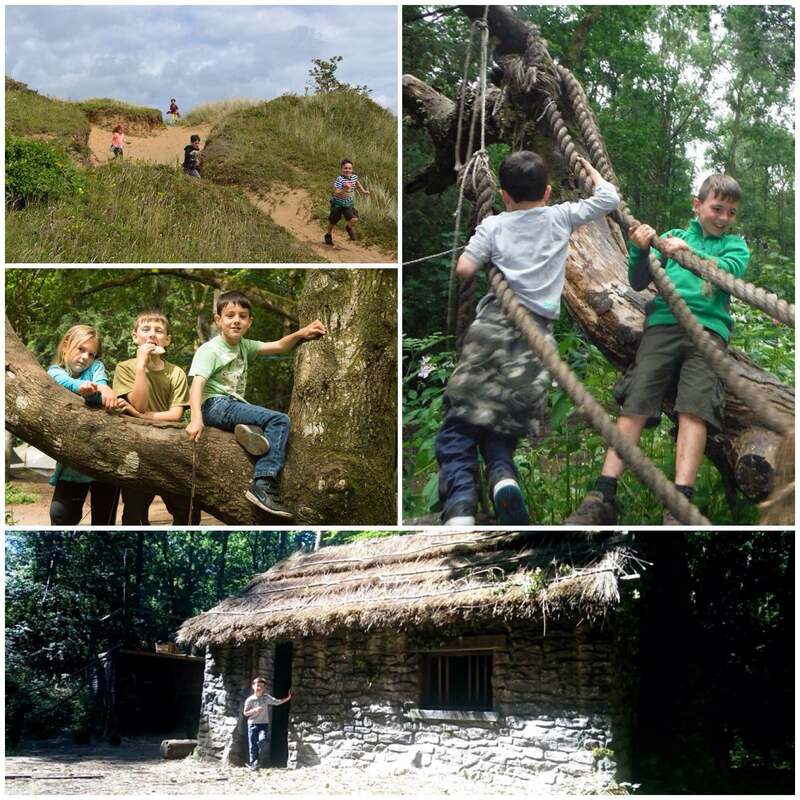 Next year it will be at the beginning of August on the coast at Merthyr Mawr in South Wales.